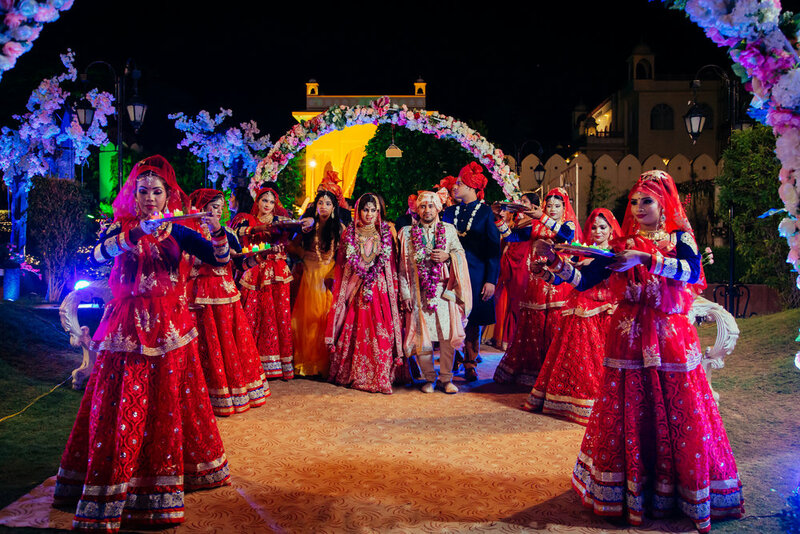 When you think Rajasthan, you think of the Thar desert, the colourfully dressed women, you think of Kesariya Balam Padharo Mhare Des, of stories of princes and princesses, of beautiful palaces, you think of a very Royal splendour. 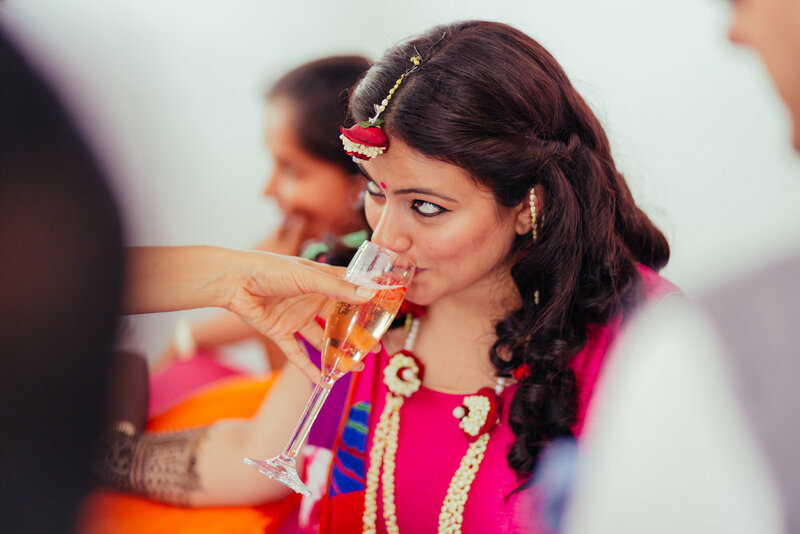 Seeing Himangi & Aadhaar evokes similar feelings. 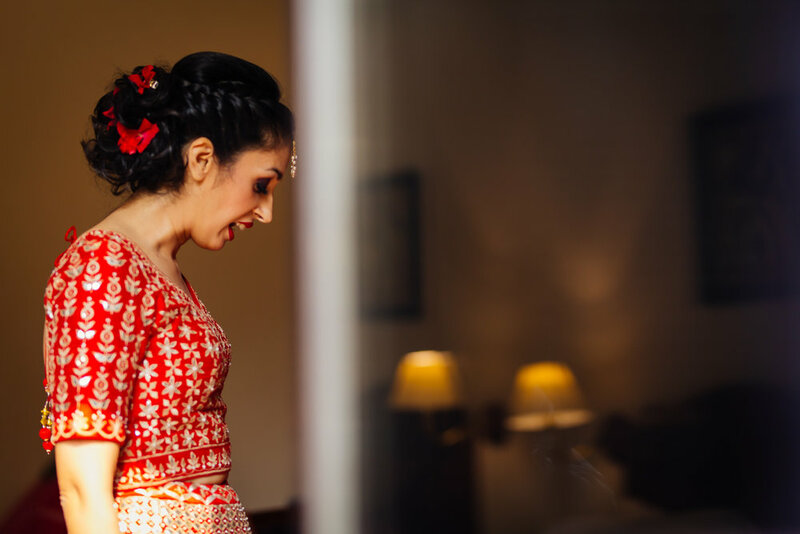 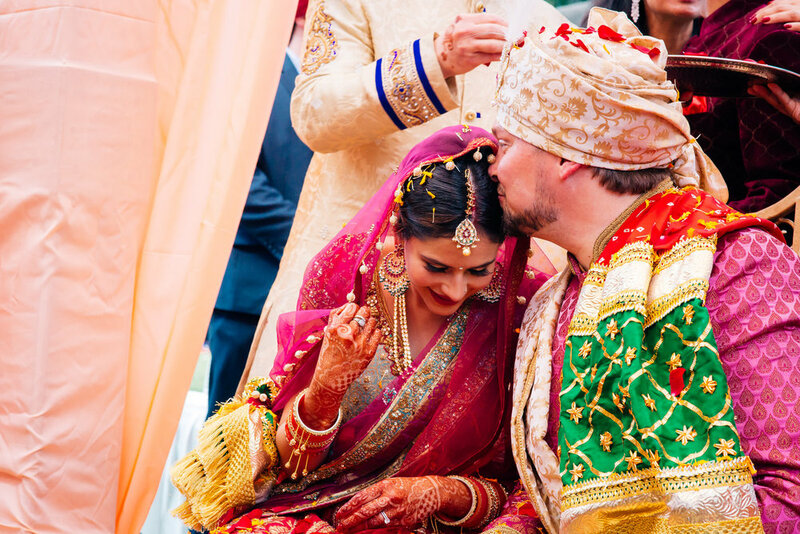 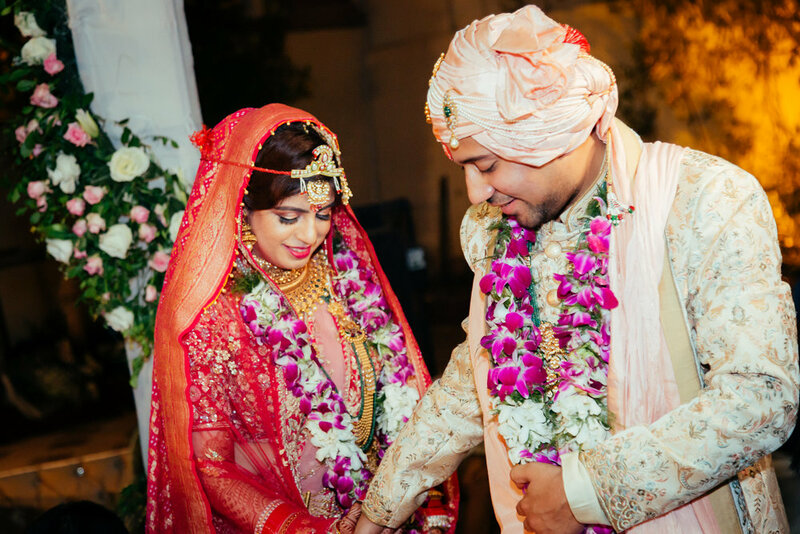 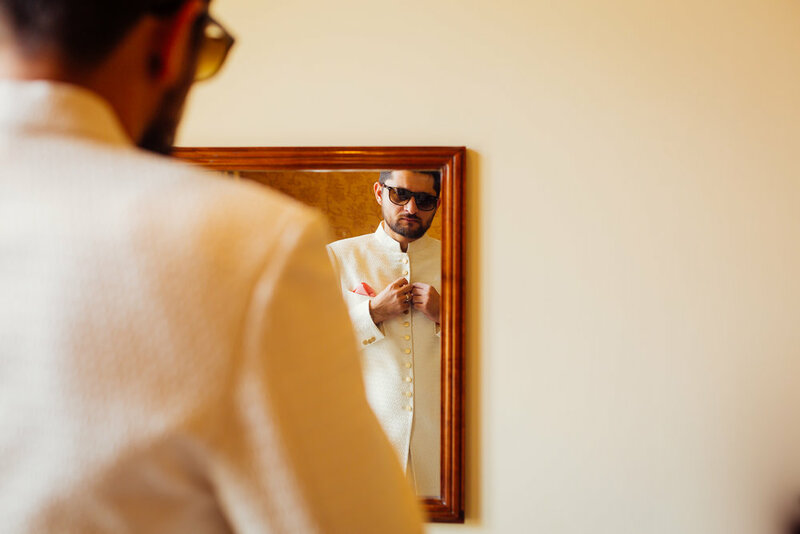 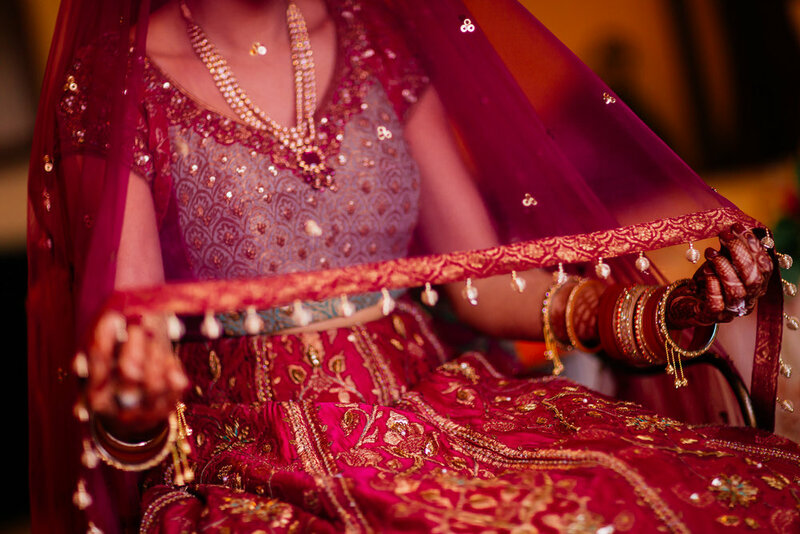 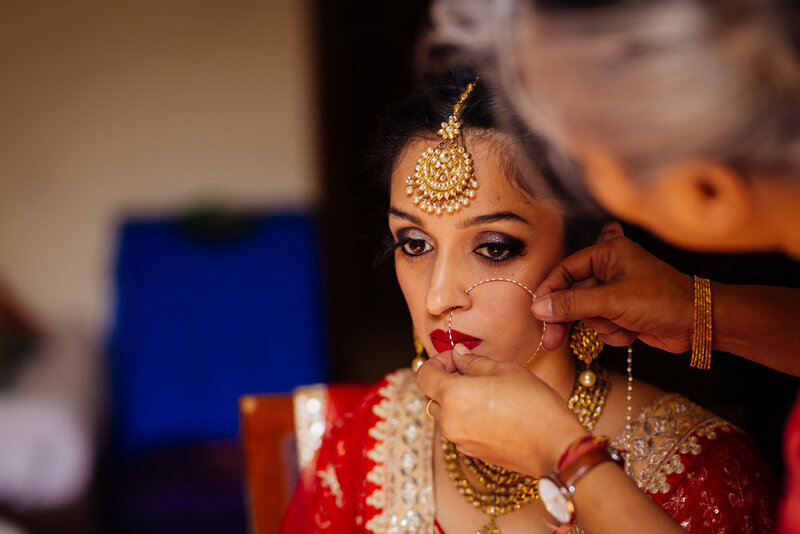 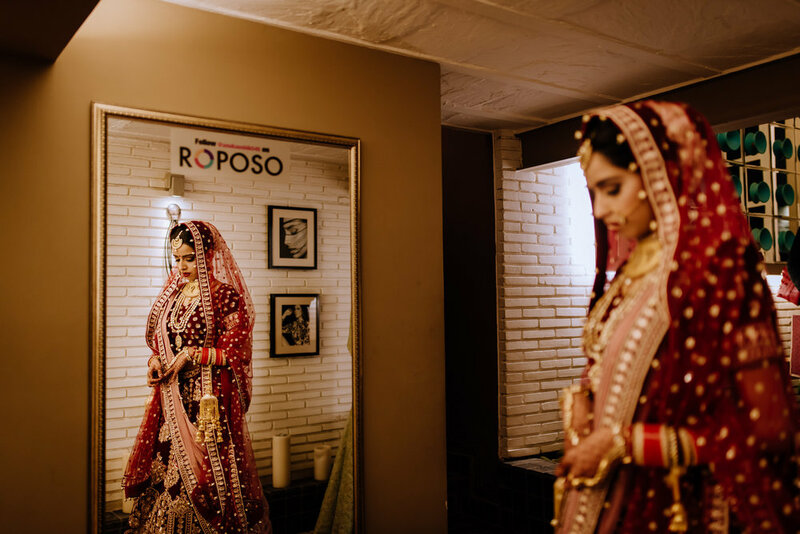 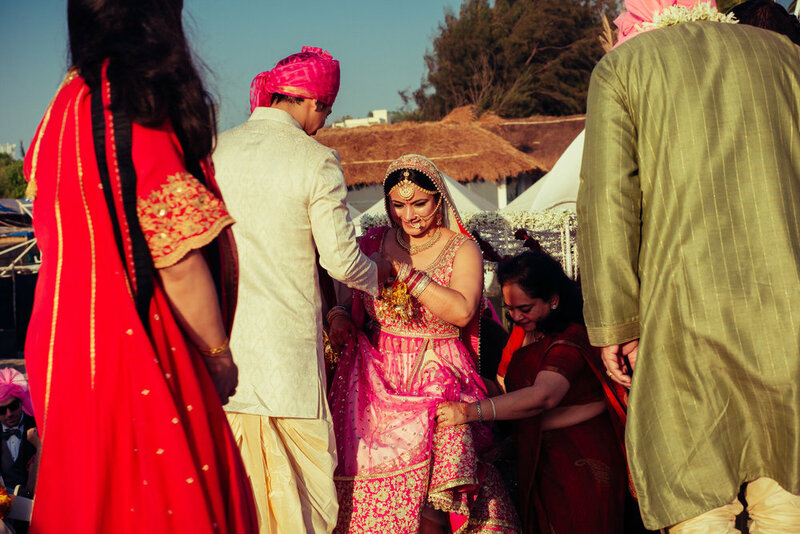 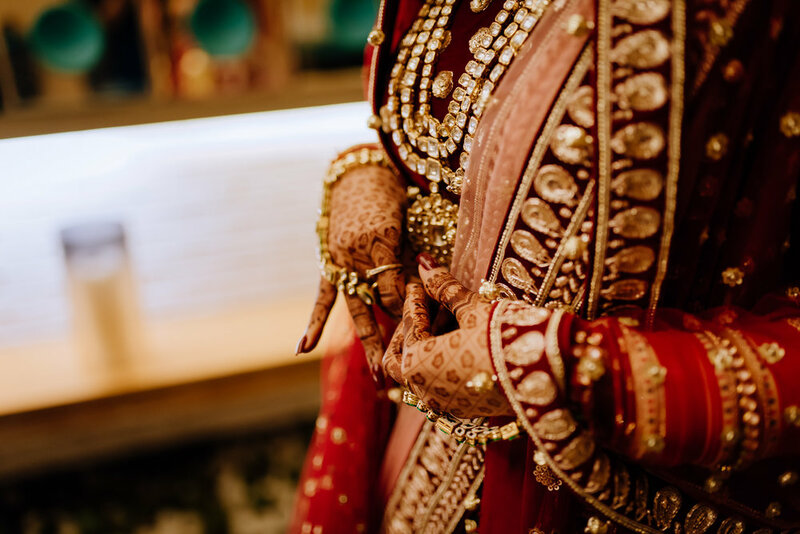 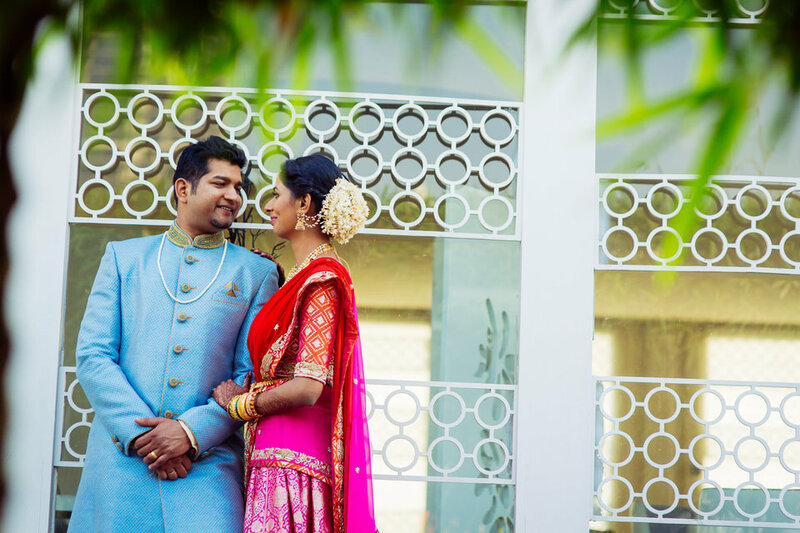 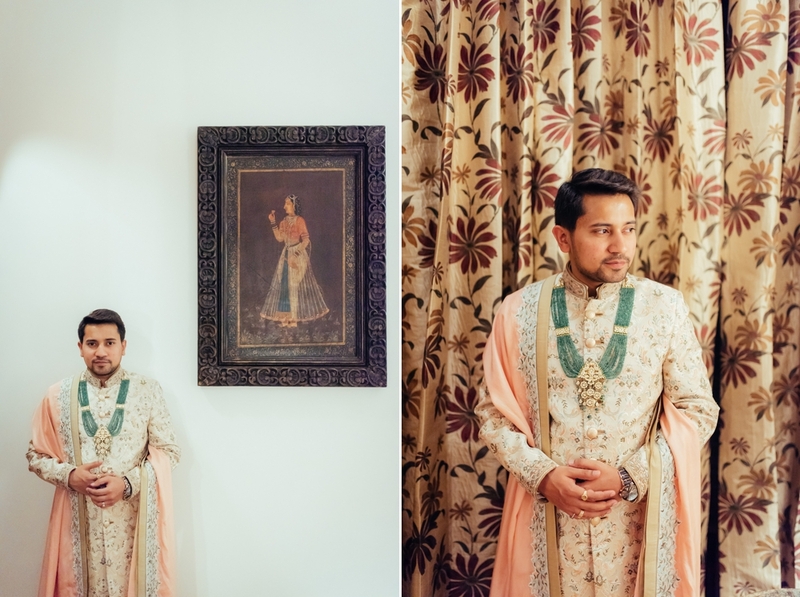 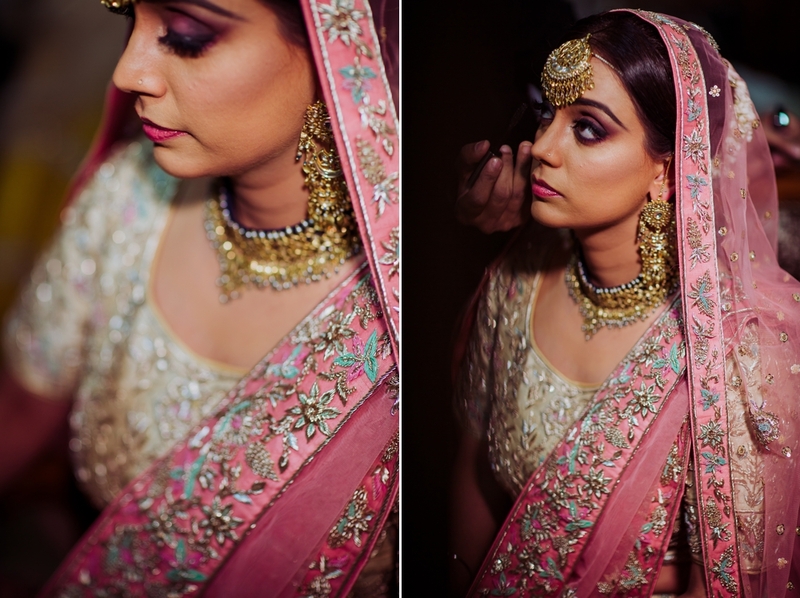 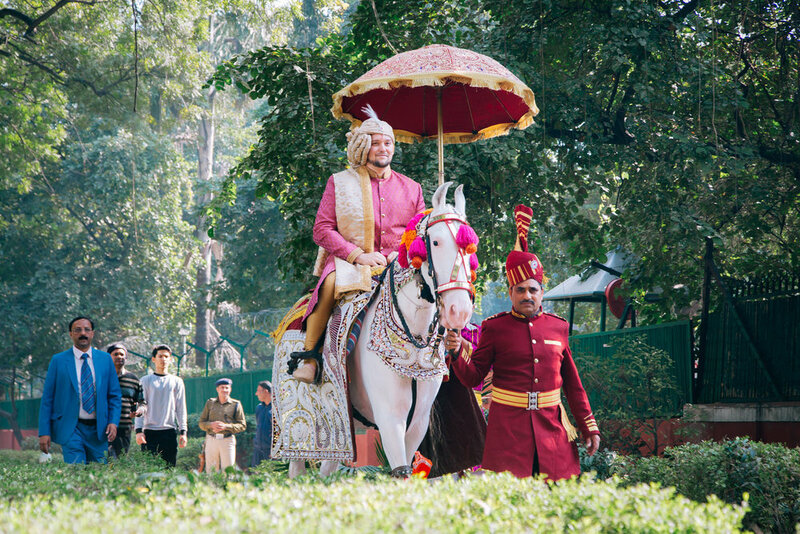 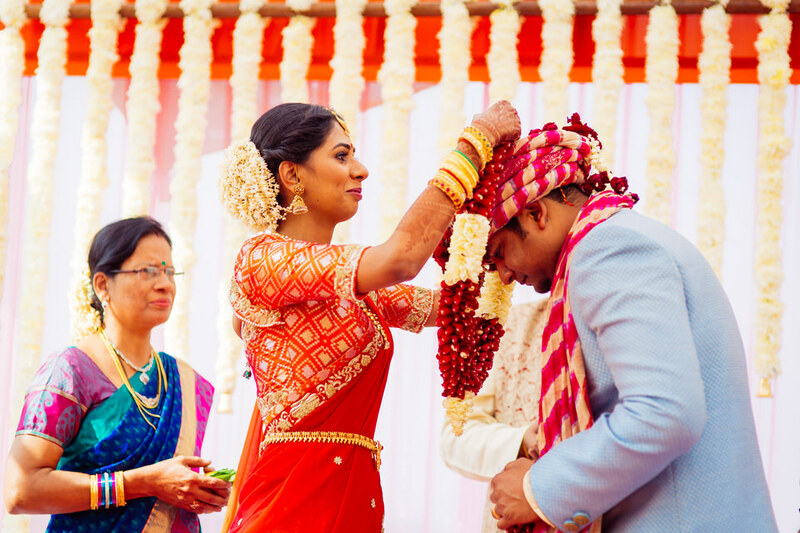 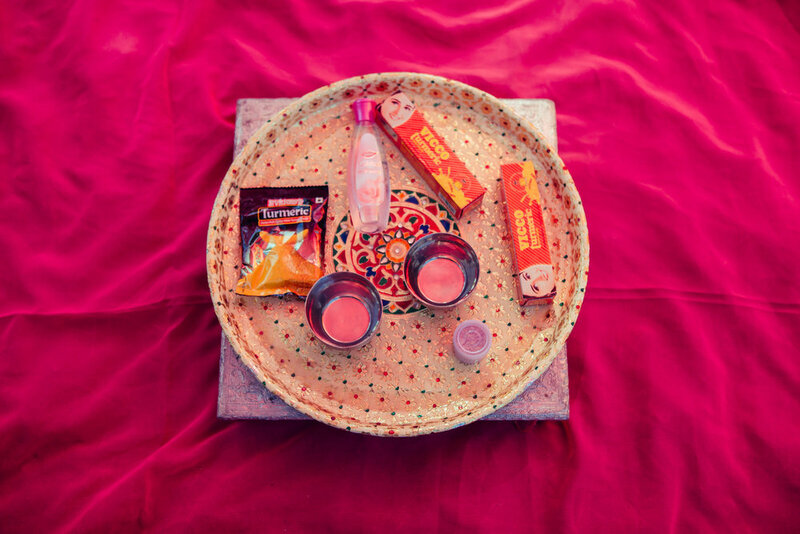 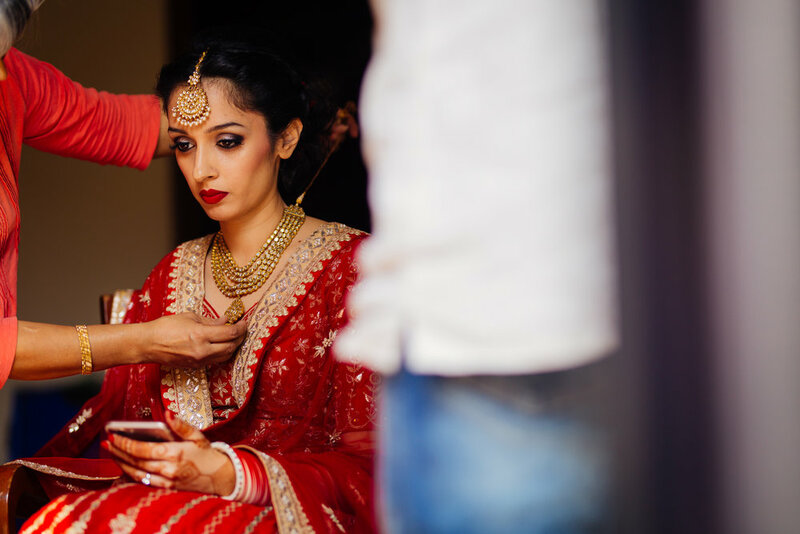 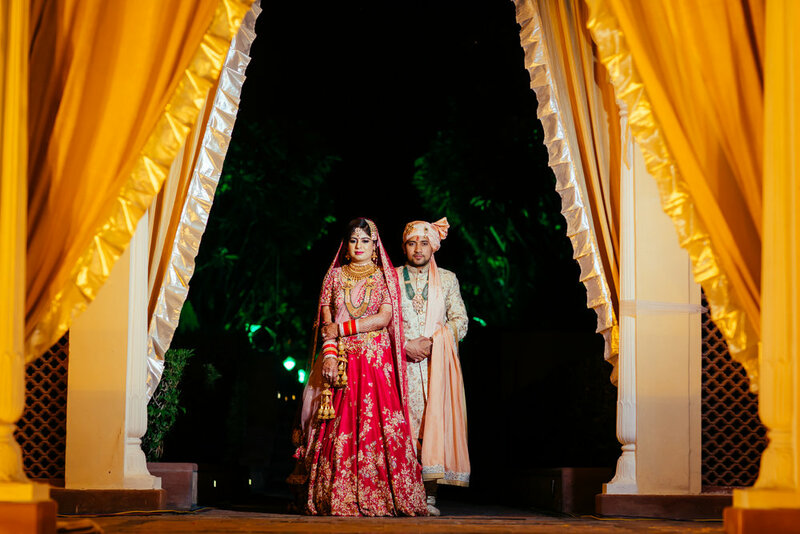 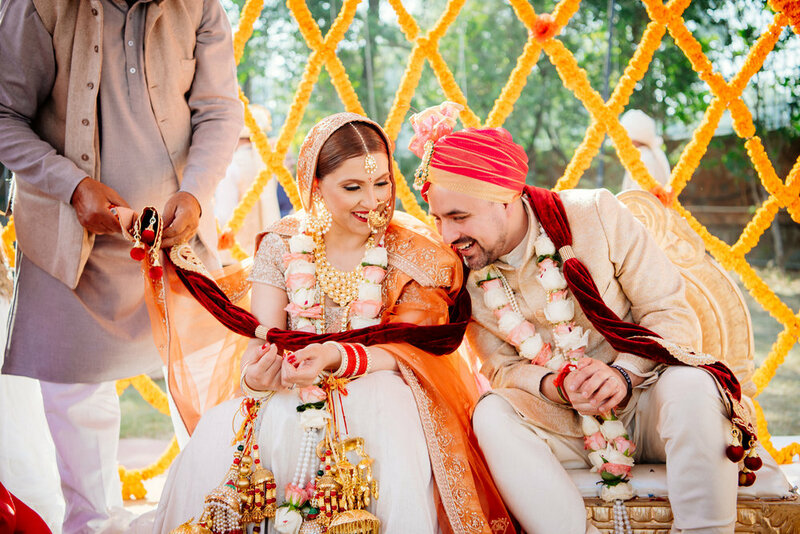 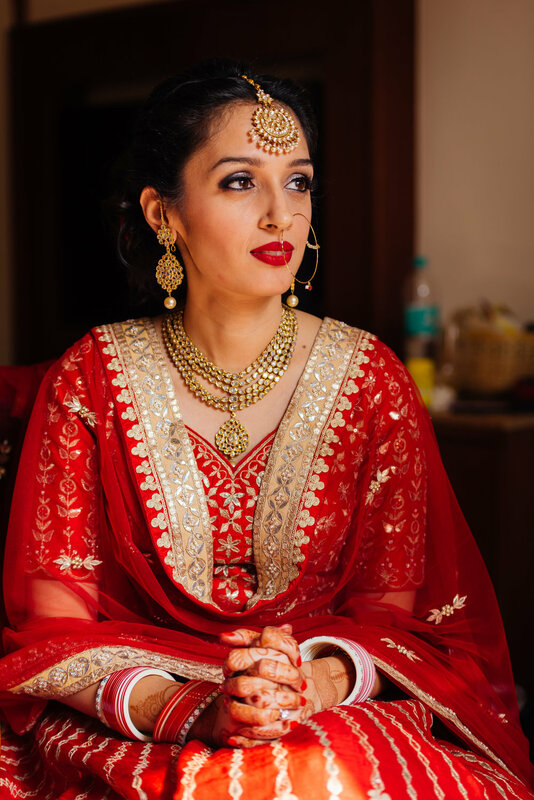 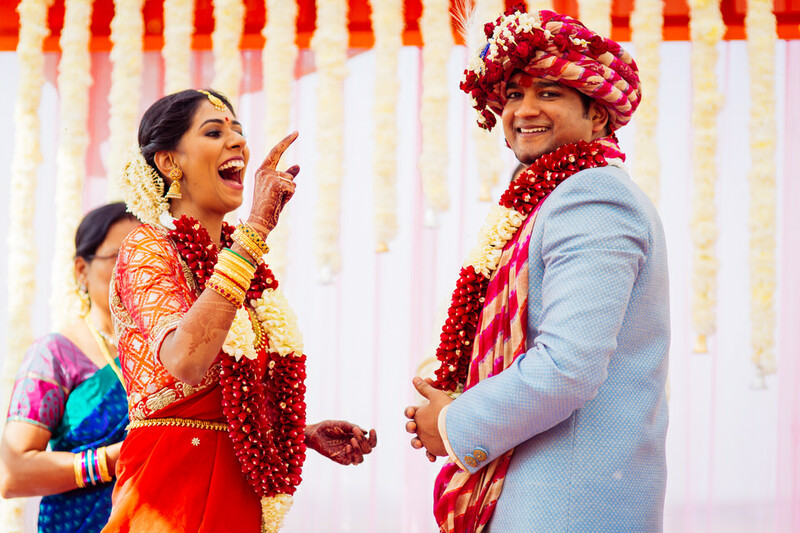 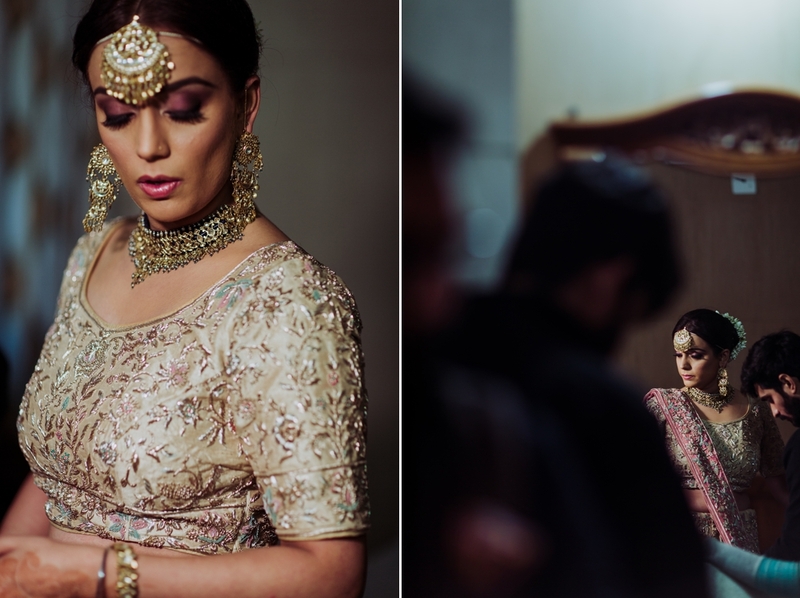 Their wedding in Jaipur was steeped in the richness of tradition. 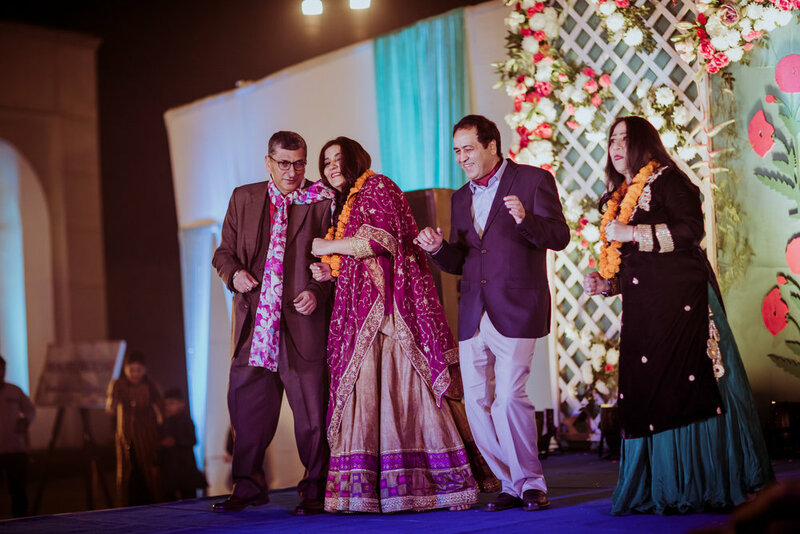 The evening saw Himangi & Aadhaar in the glam avatars as they dazzled off and on the stage on their Sangeet night. 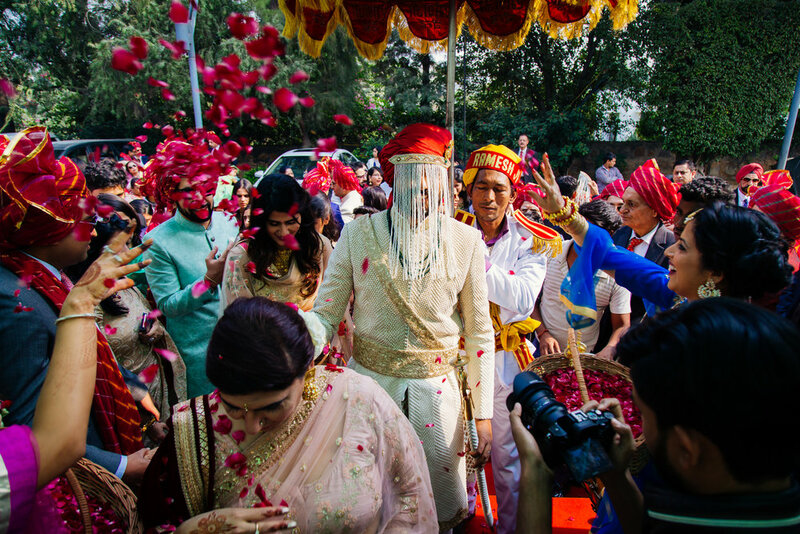 All of Himanagi’s & Aadhaar’s cousins and friends put up stellar performances & the couple formally exchanged rings, as a part of their Sagai. 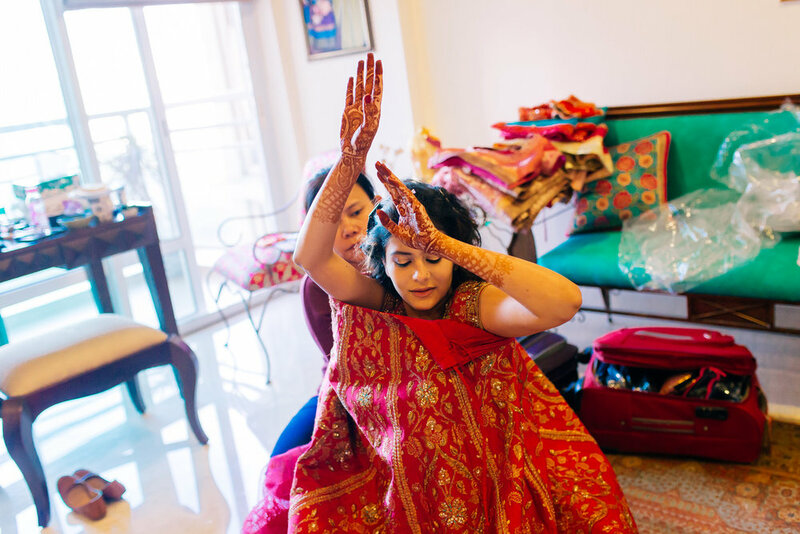 We had to take some time out to appreciate Himangi and Aadhaar’s fuss-free varmala held up-high in a jharokha with beautifully scalloped edges and intricate jallies. 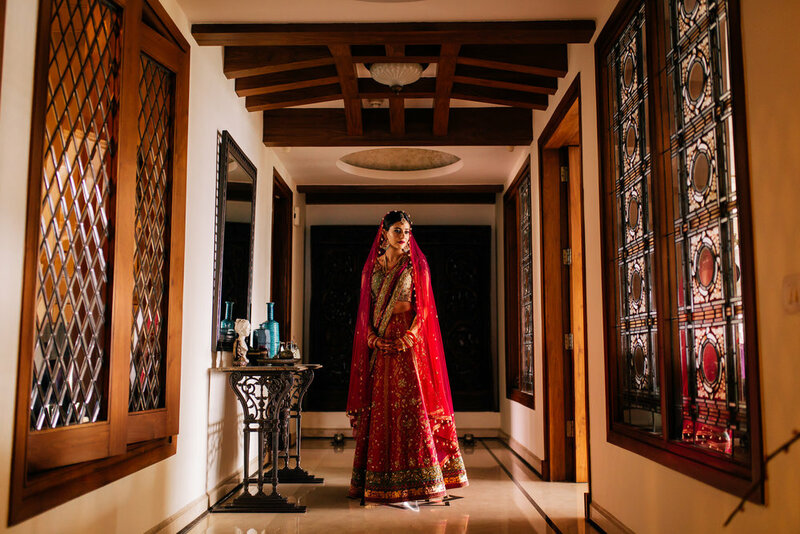 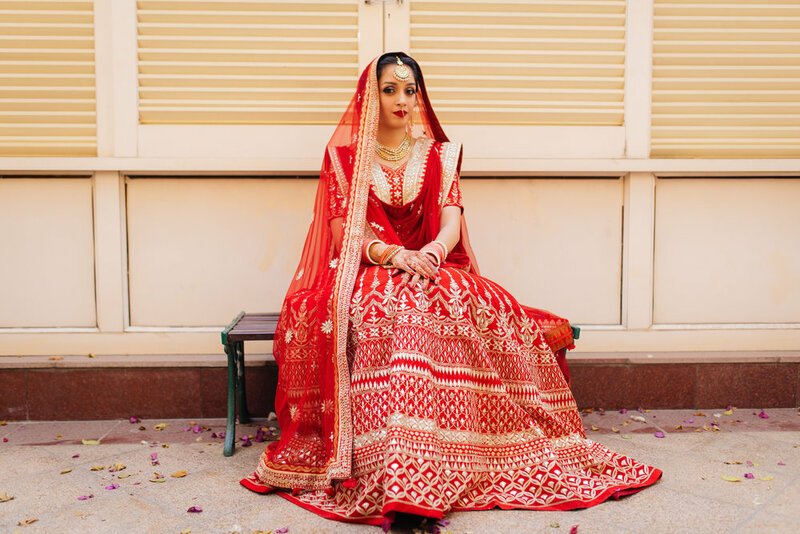 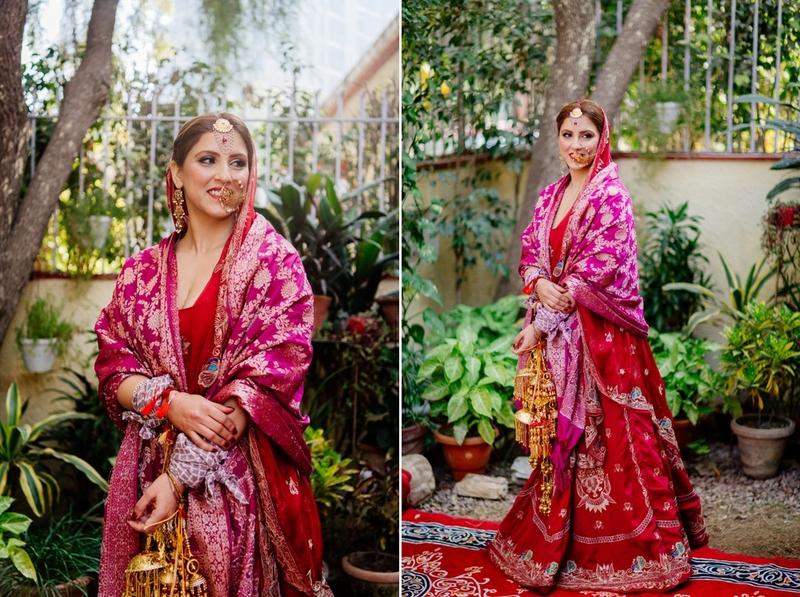 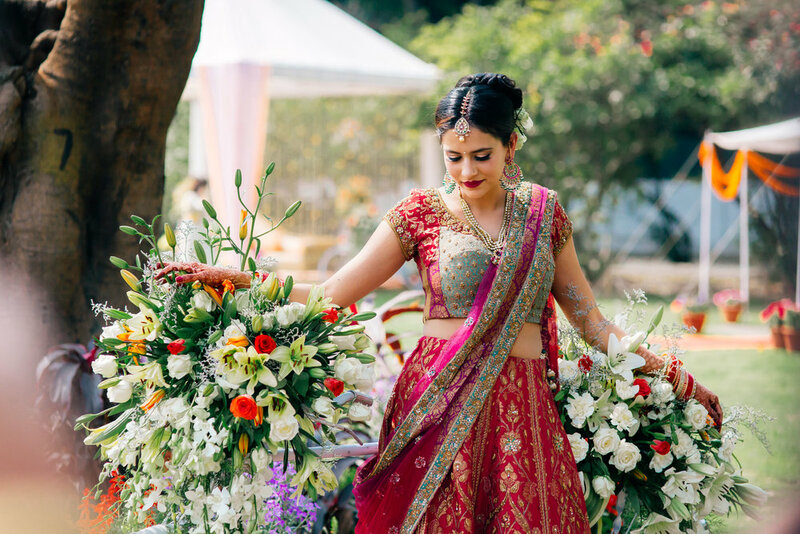 Dressed in a beautiful red lehenga , Himangi entered under a phoolon ki Chaadar made of roses. 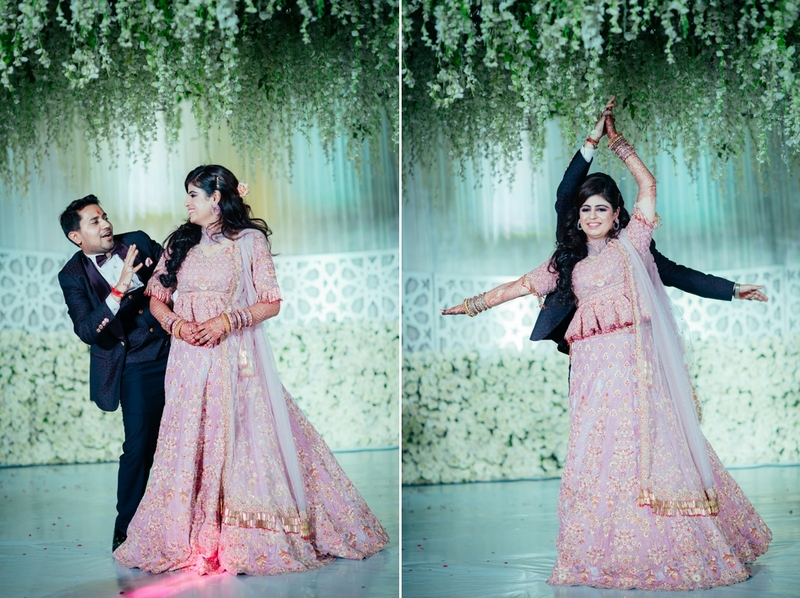 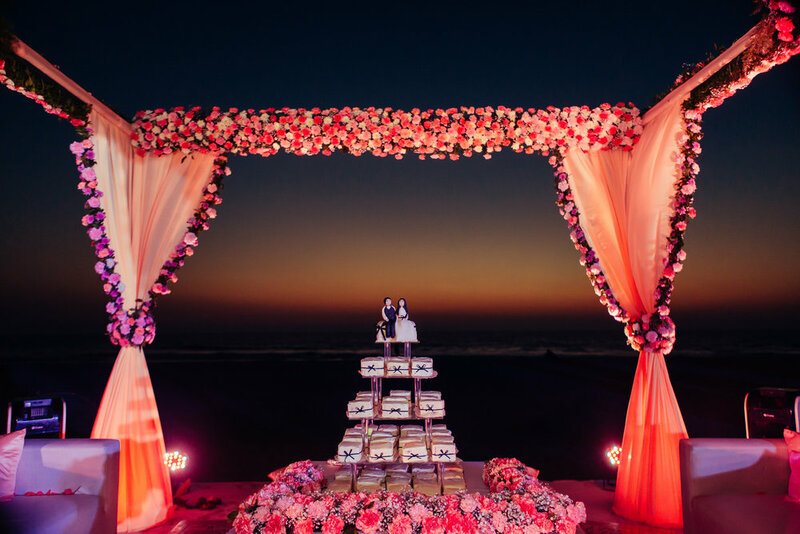 The duo exchanged rose petal varmalas with only their close relatives witnessing this first step that got the ball rolling for the other wedding rituals. 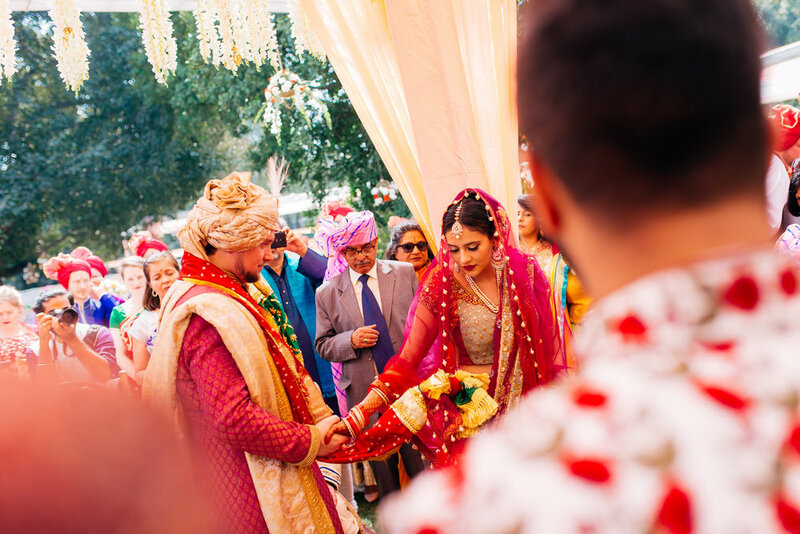 It's hard not to stare doe-eyed at a stunning destination wedding like this one, and the venue Le Meridian, Jaipur made it even more special. 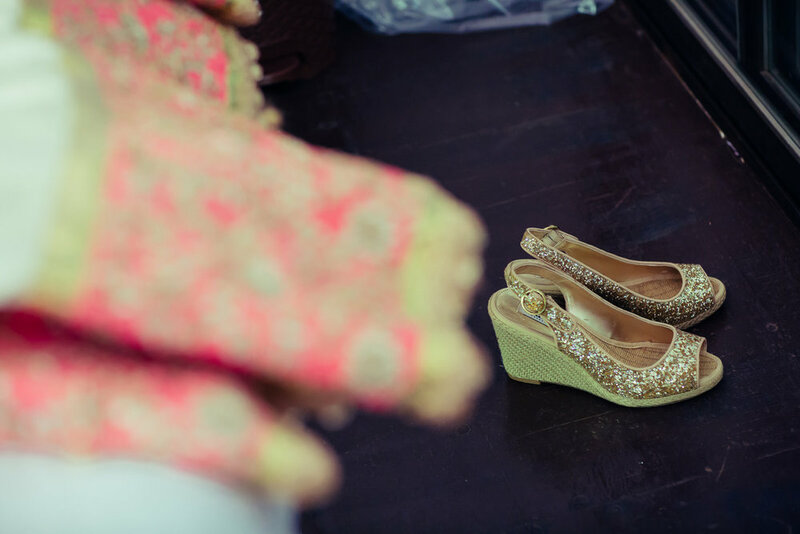 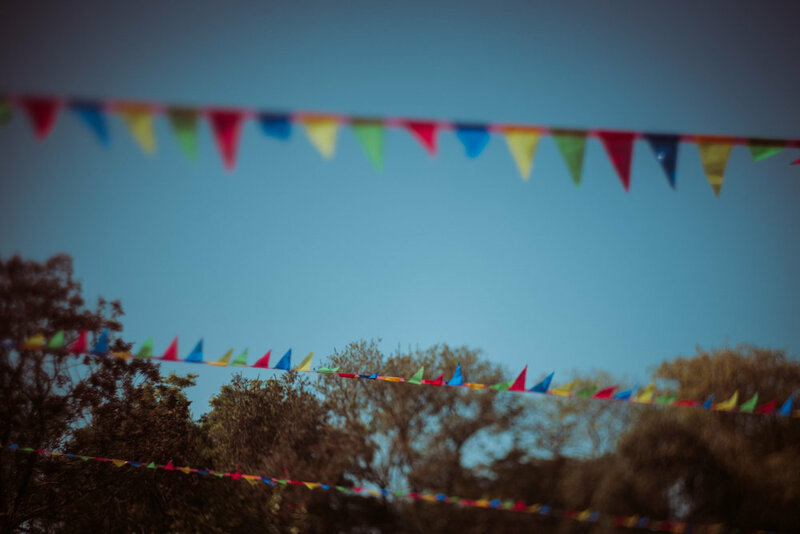 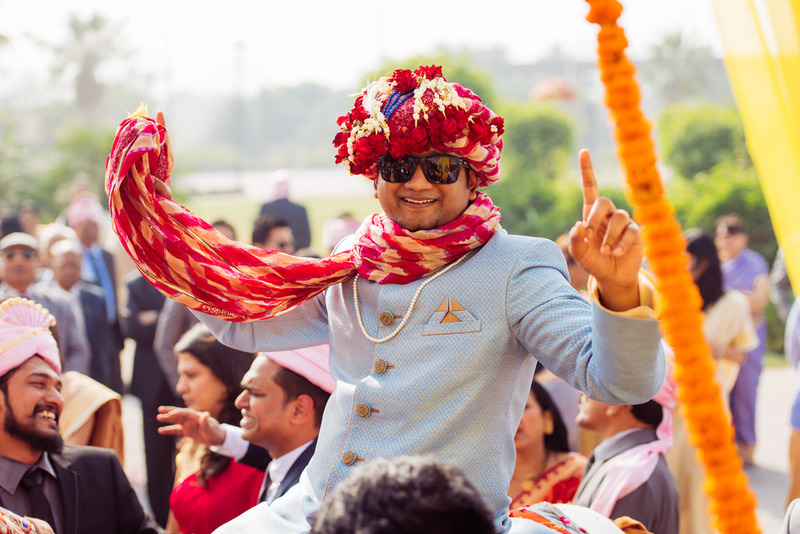 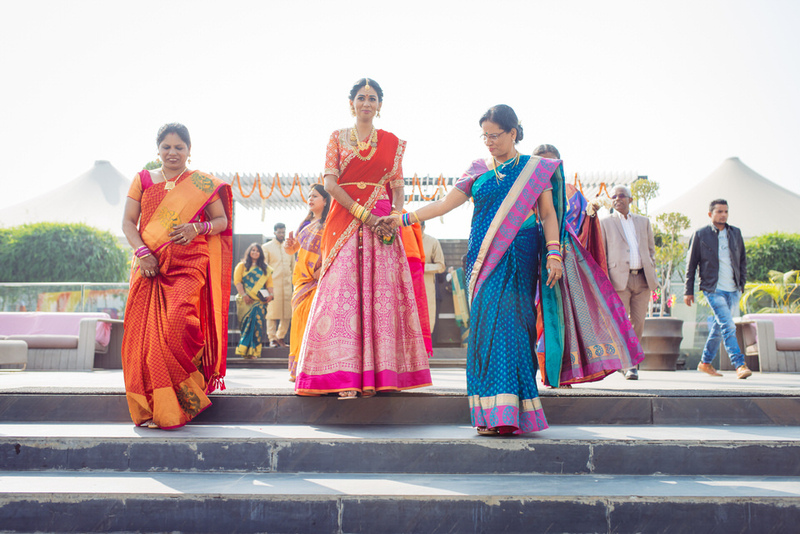 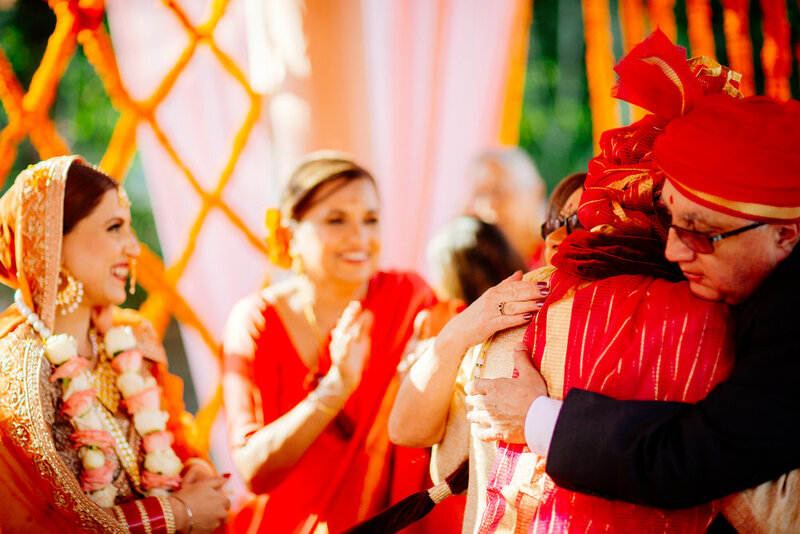 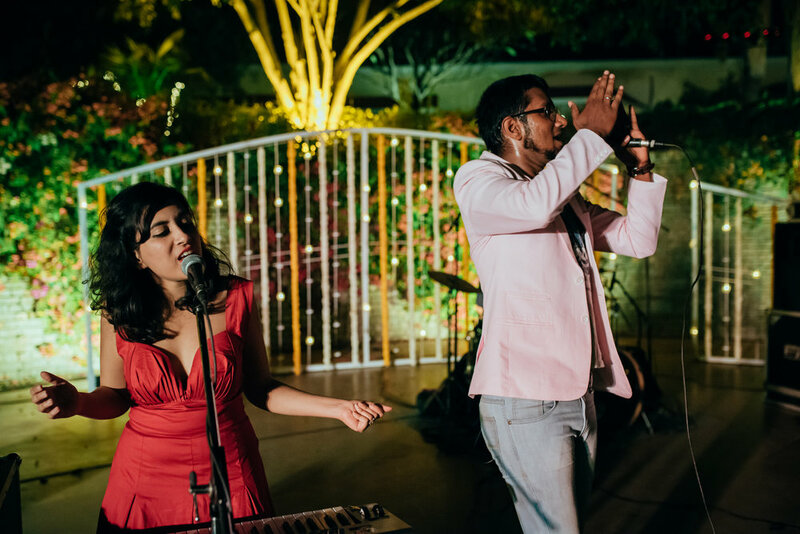 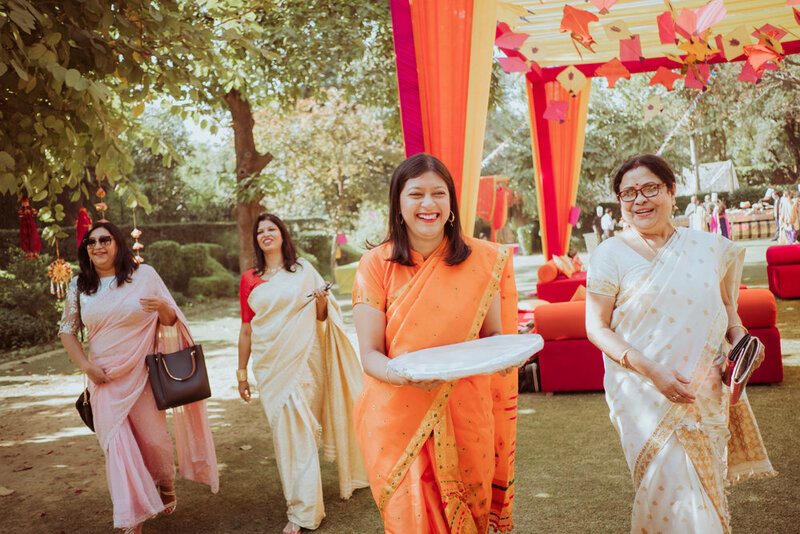 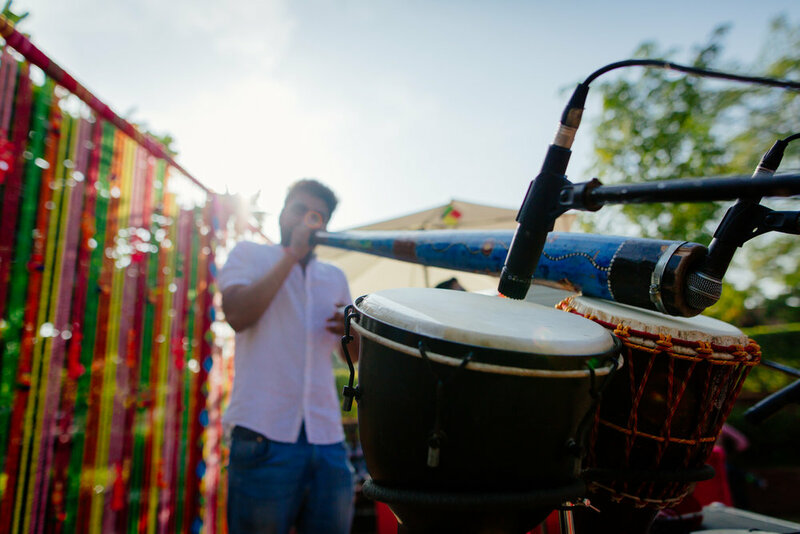 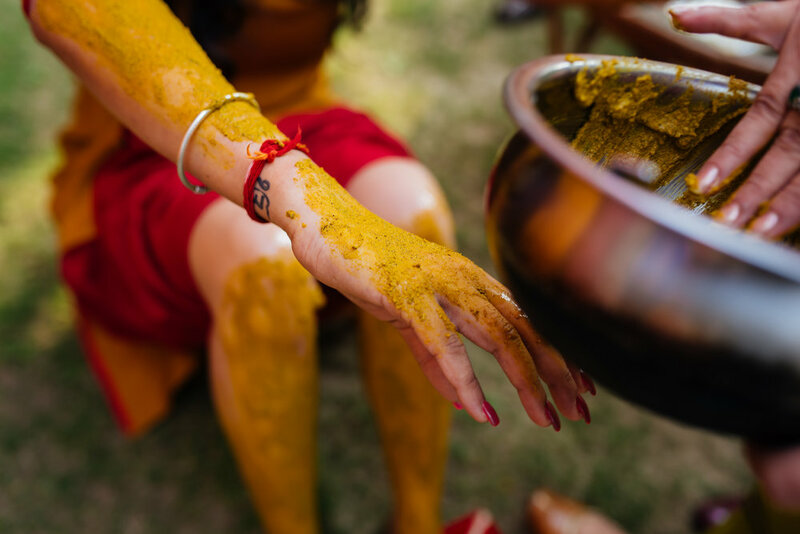 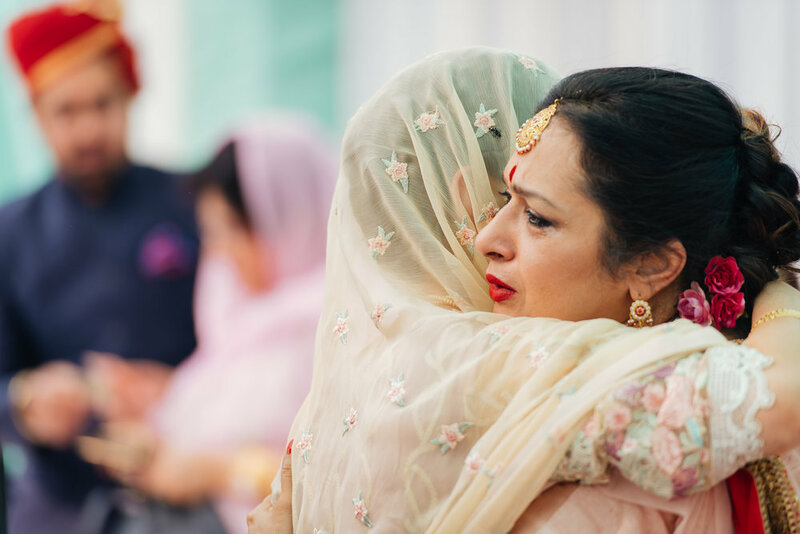 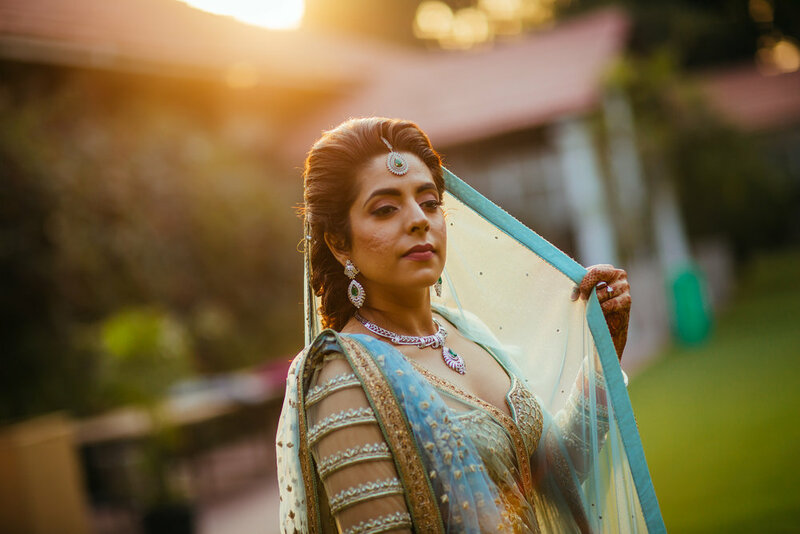 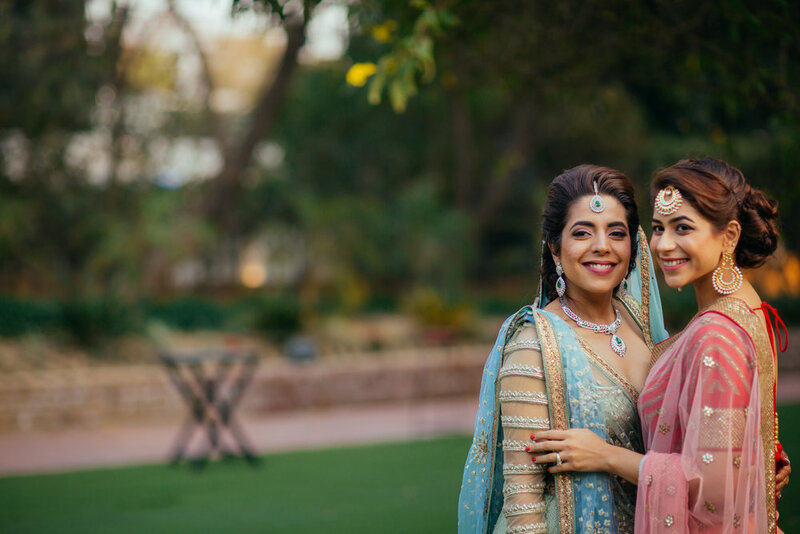 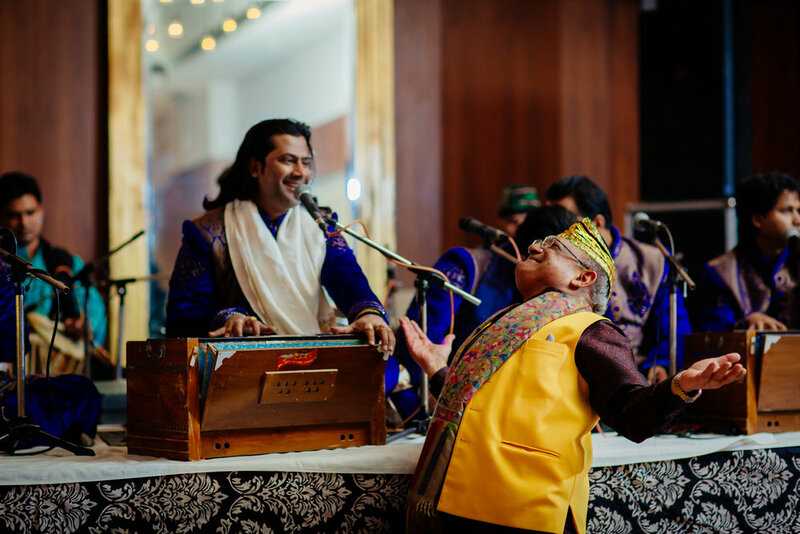 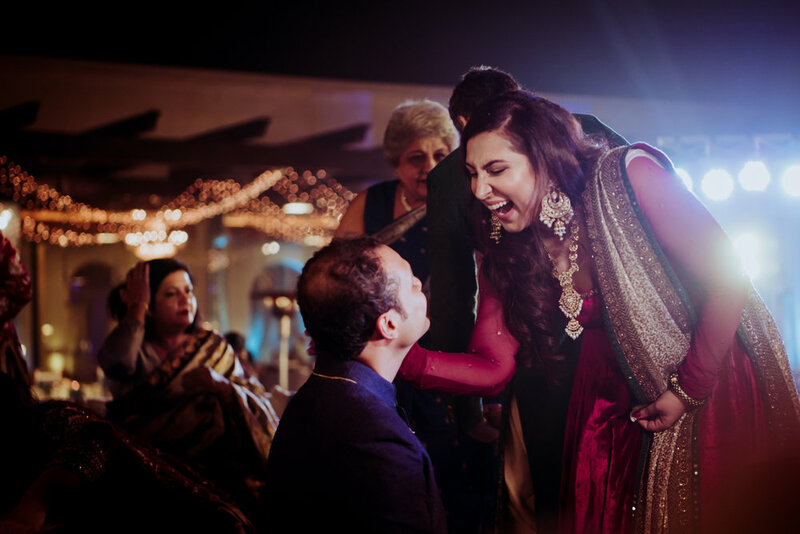 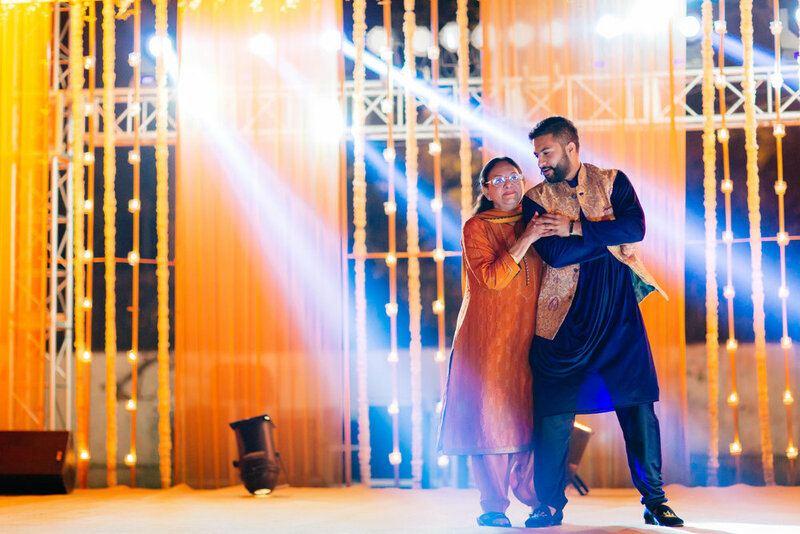 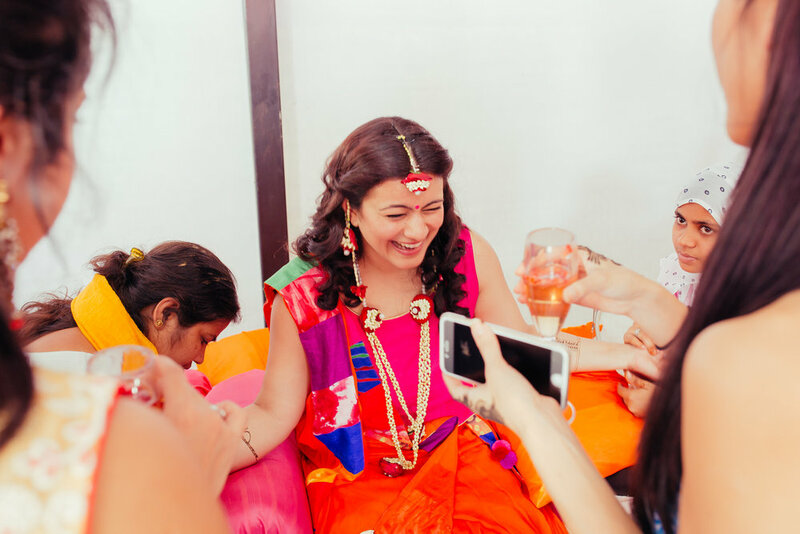 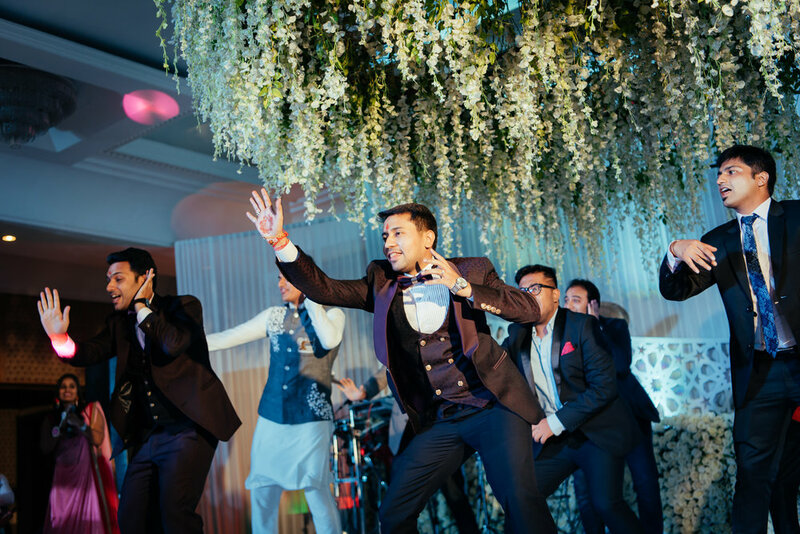 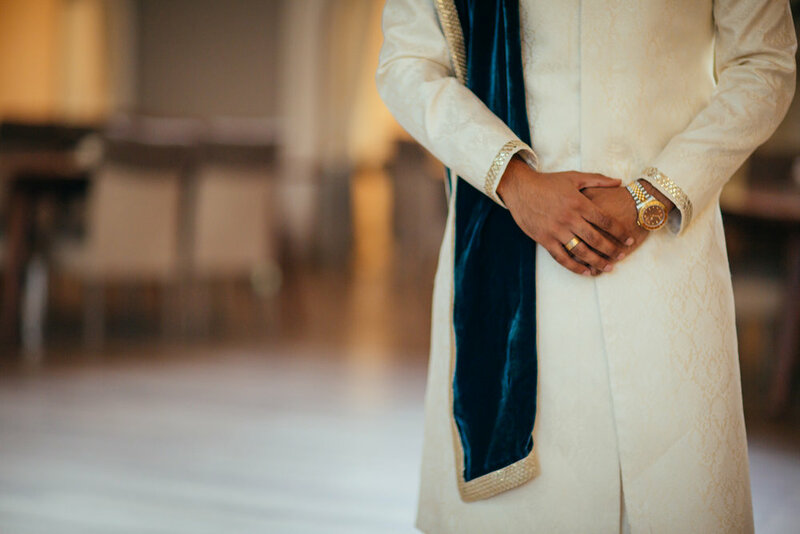 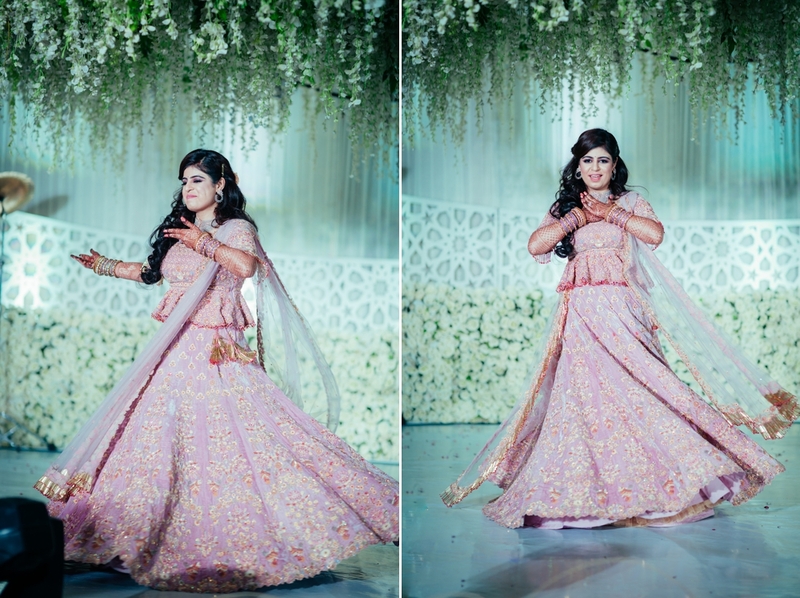 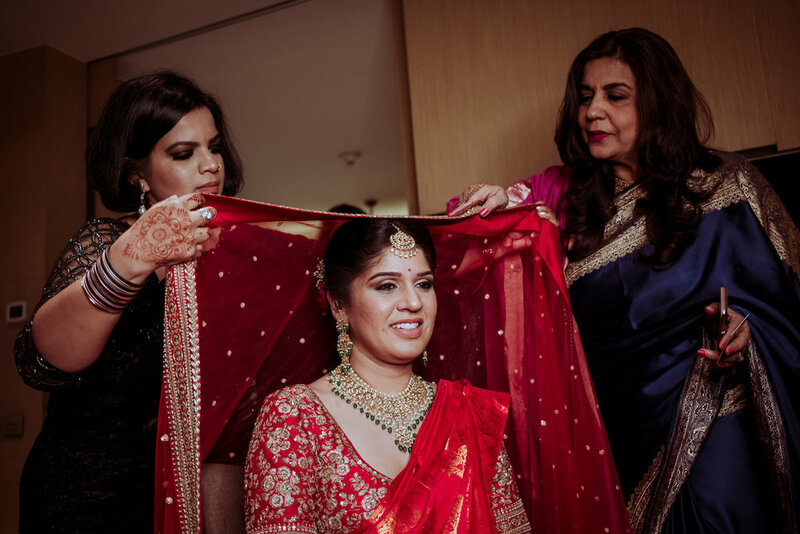 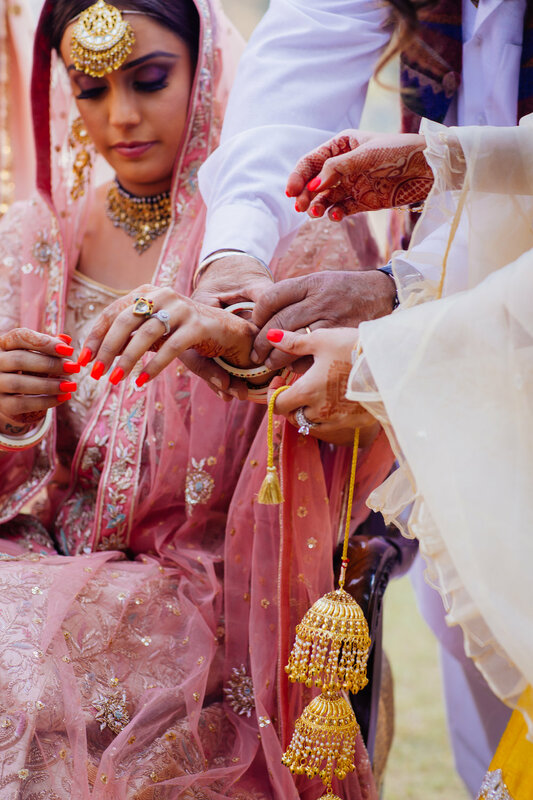 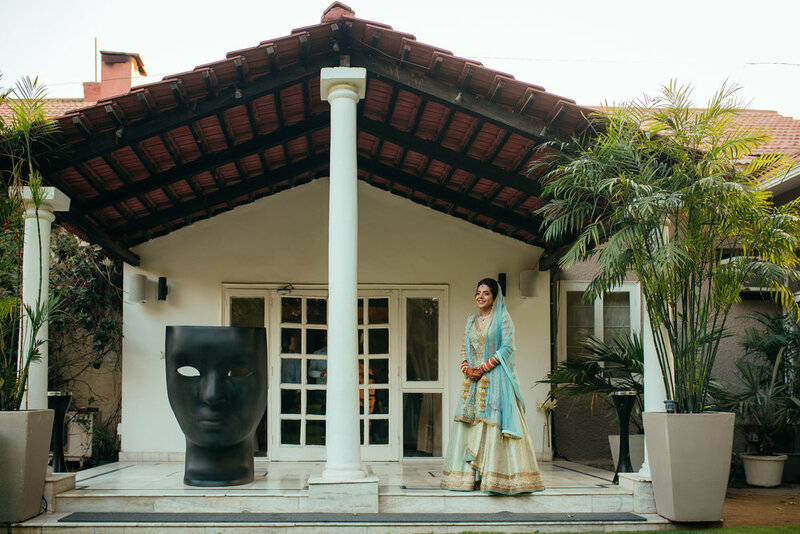 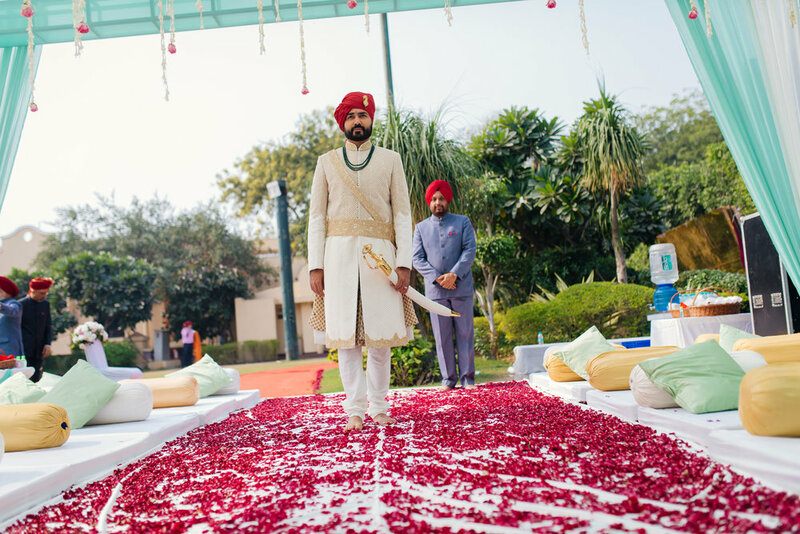 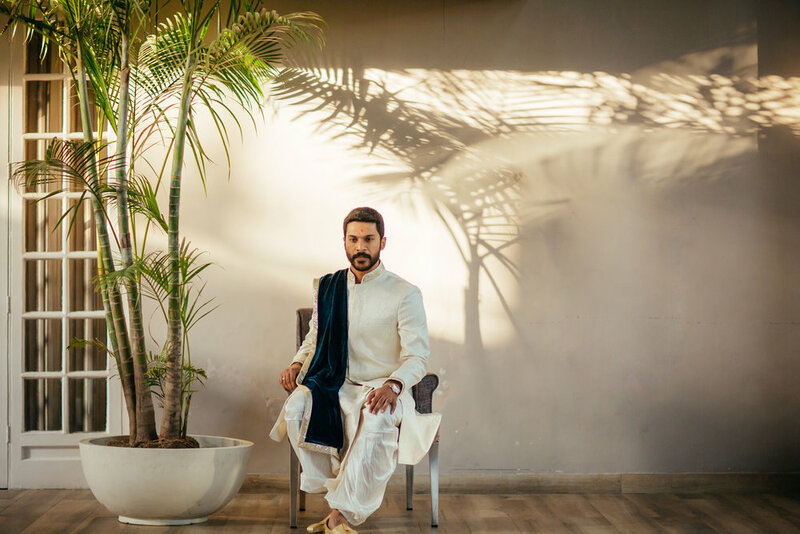 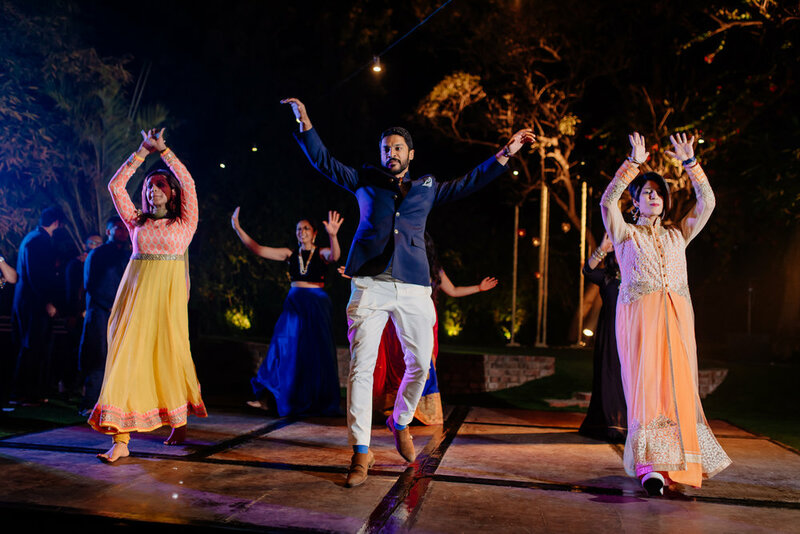 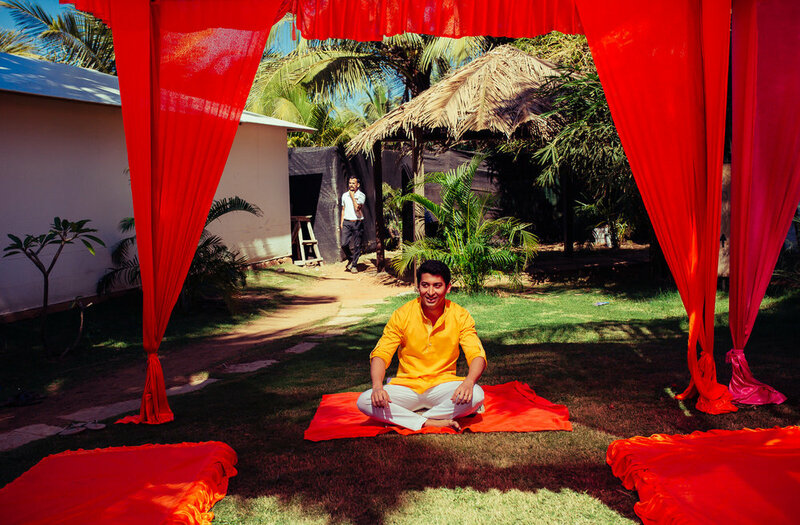 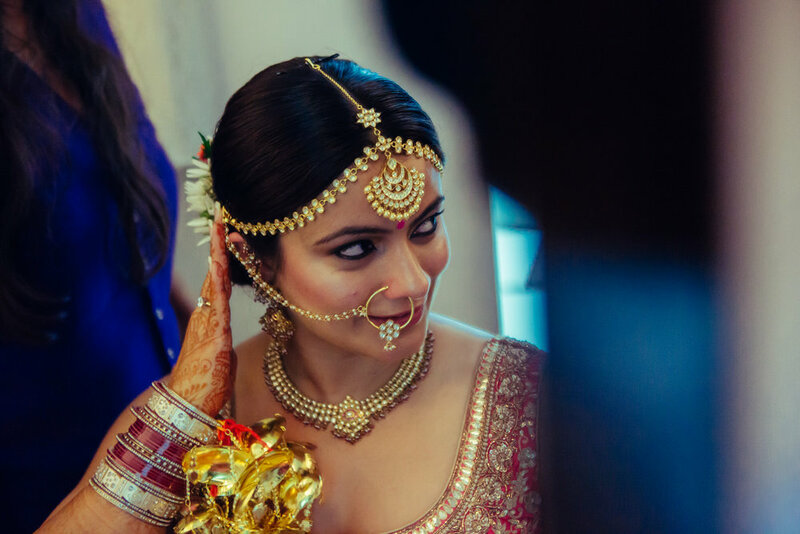 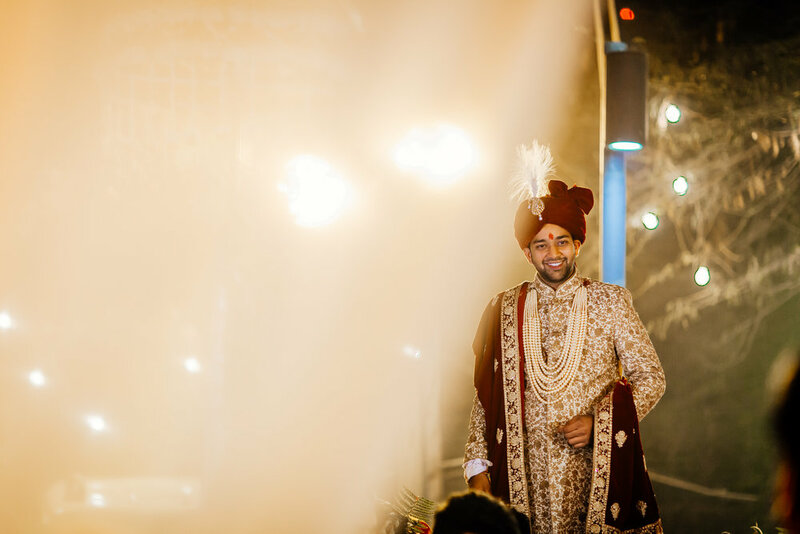 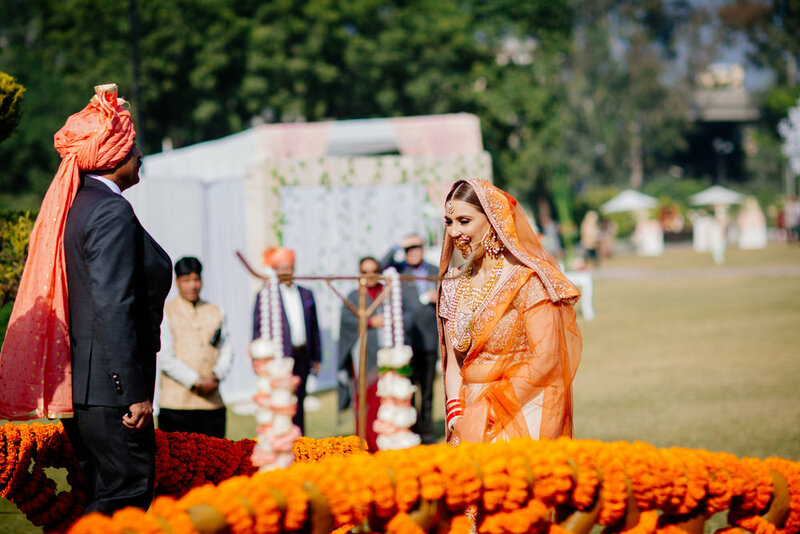 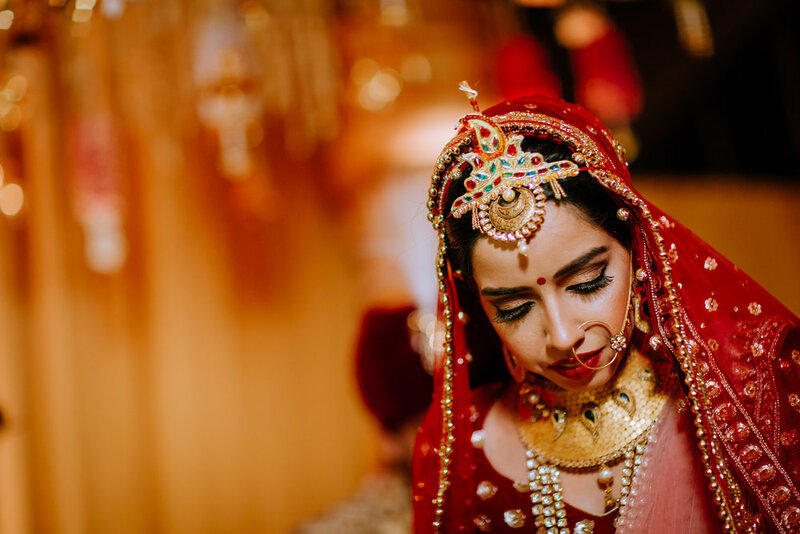 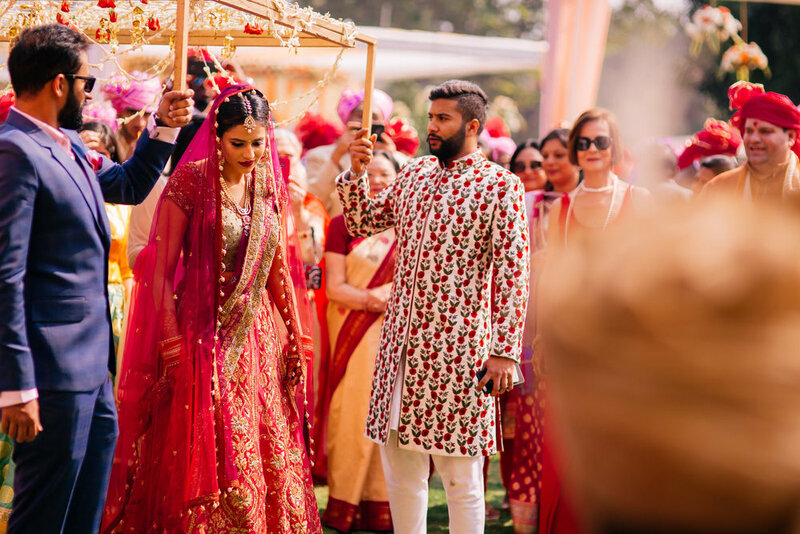 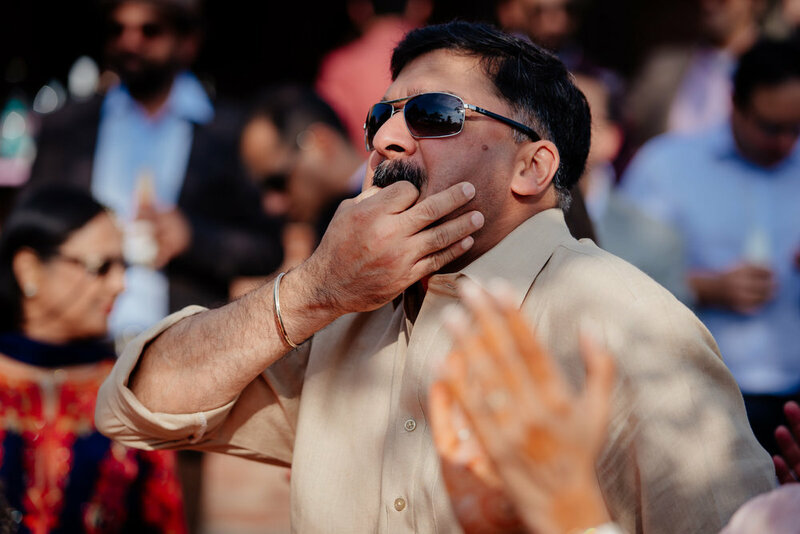 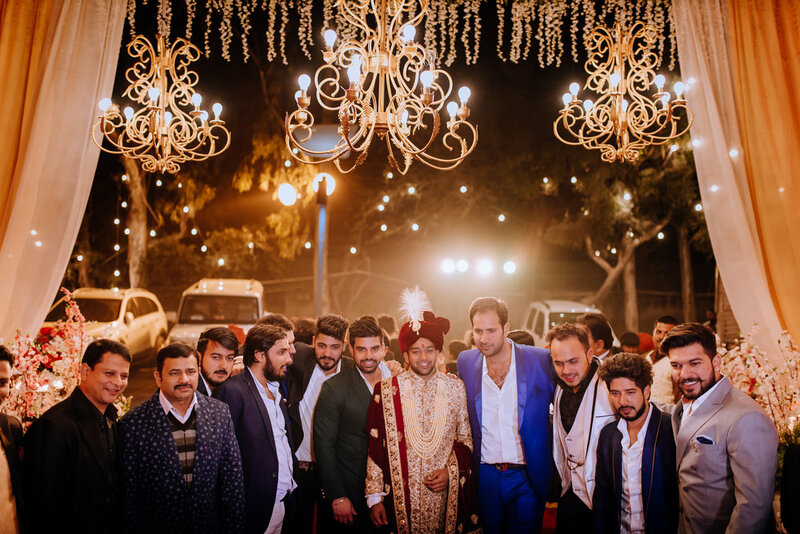 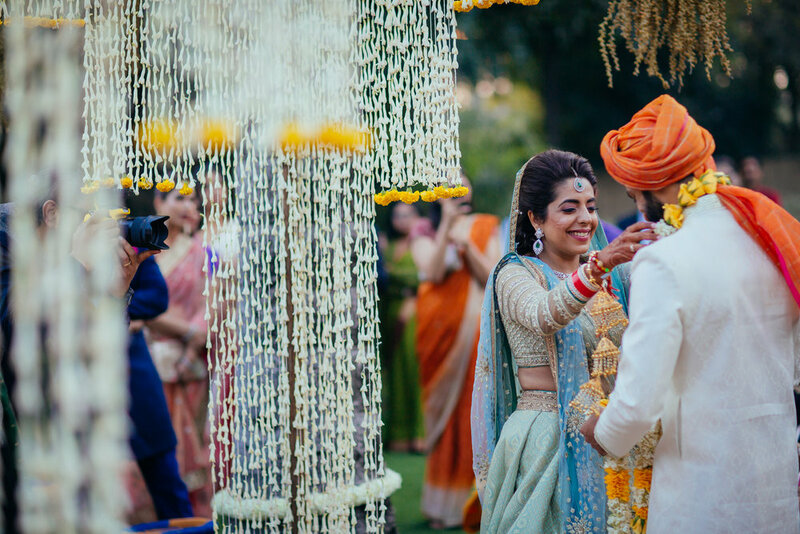 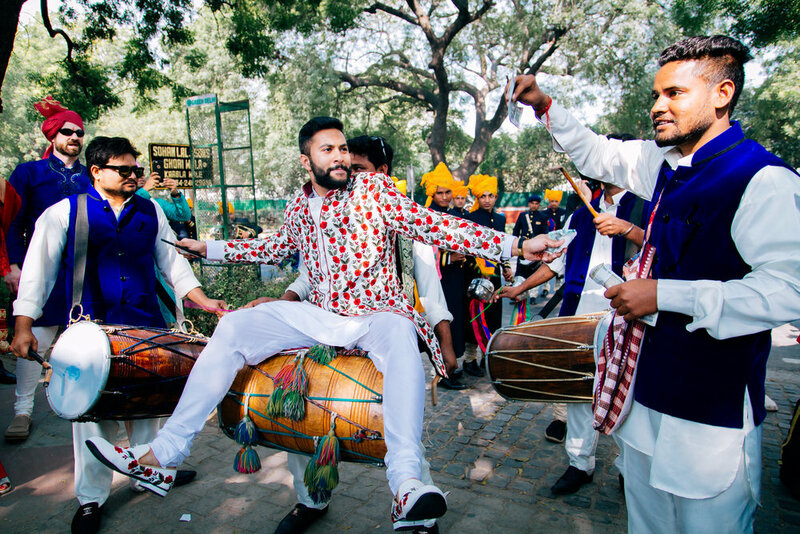 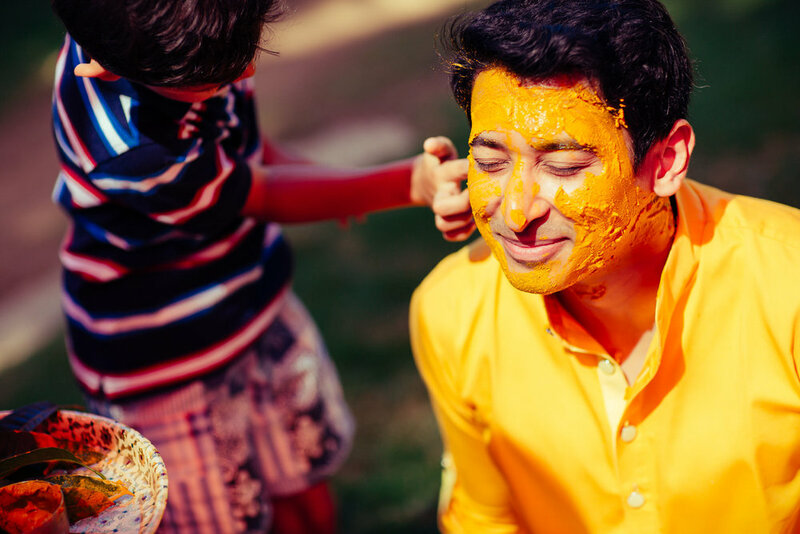 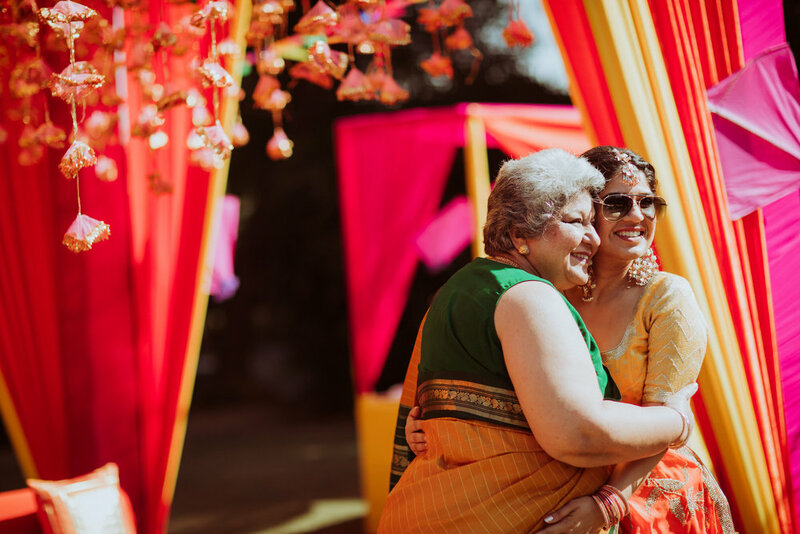 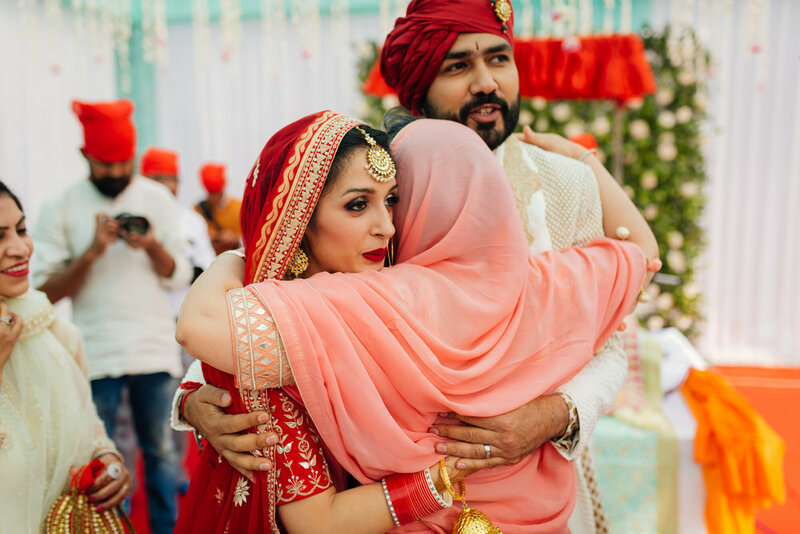 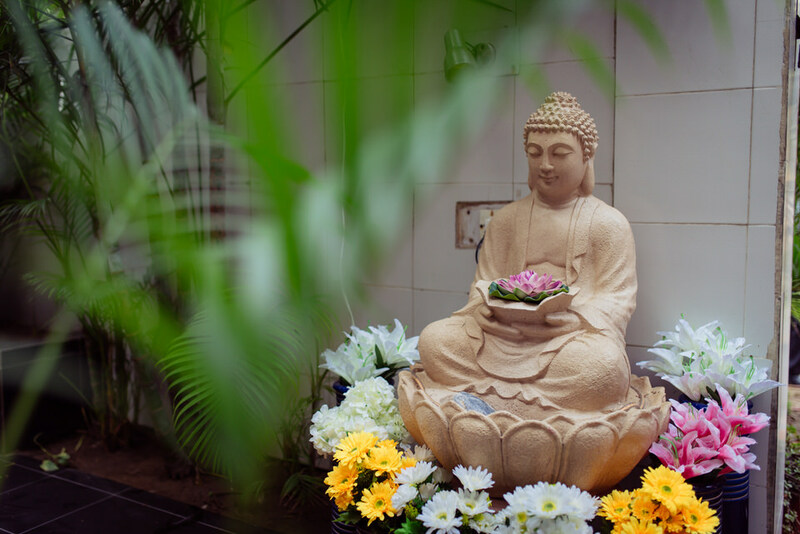 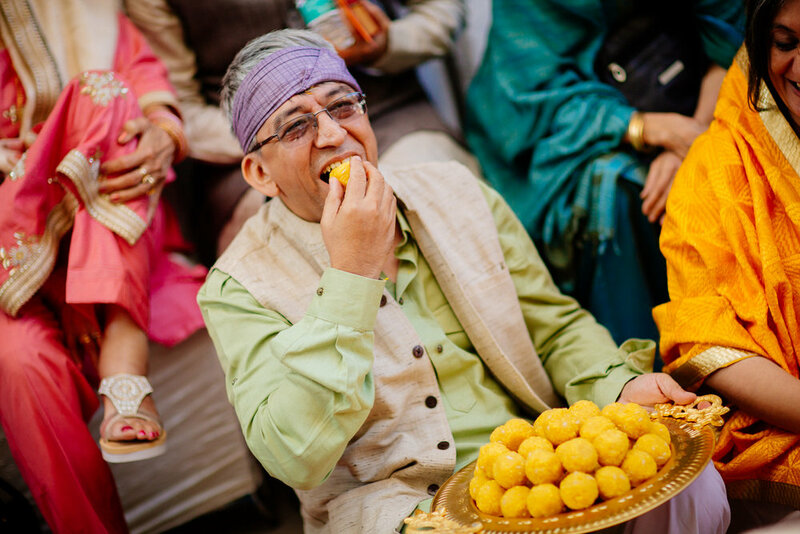 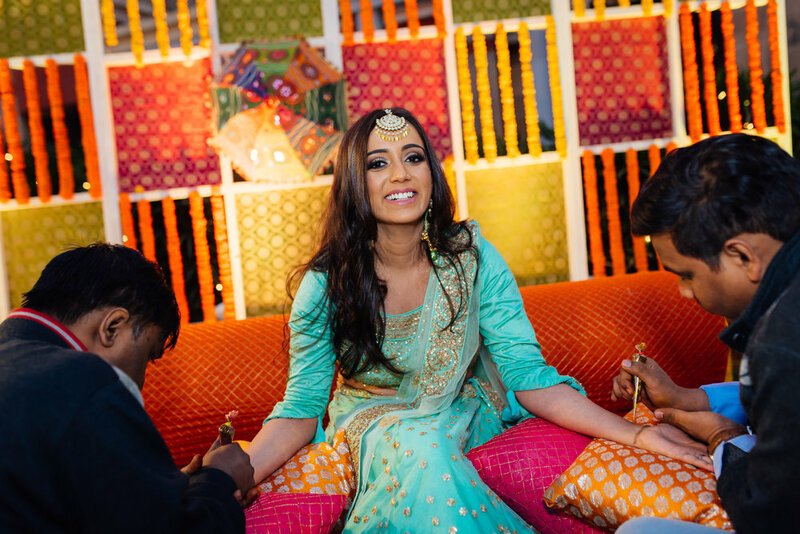 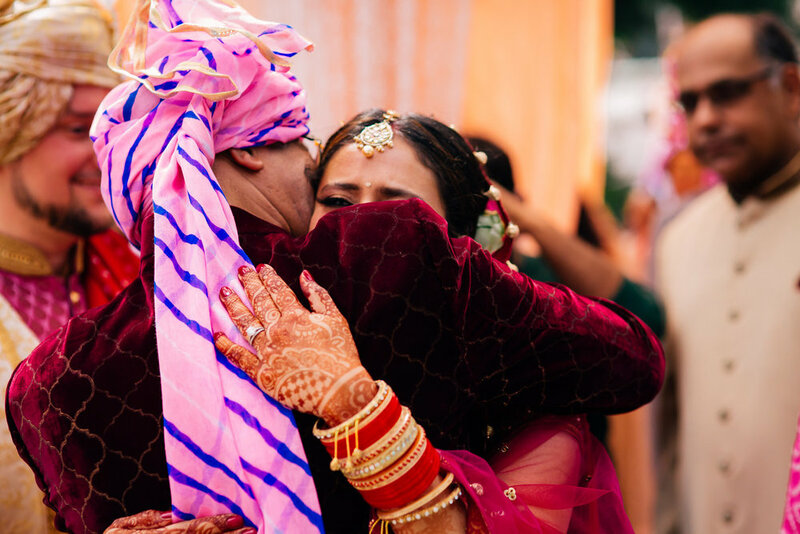 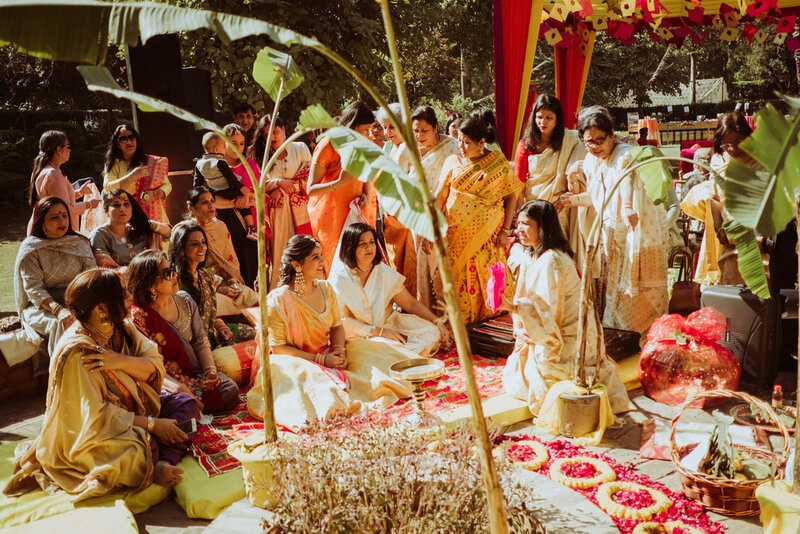 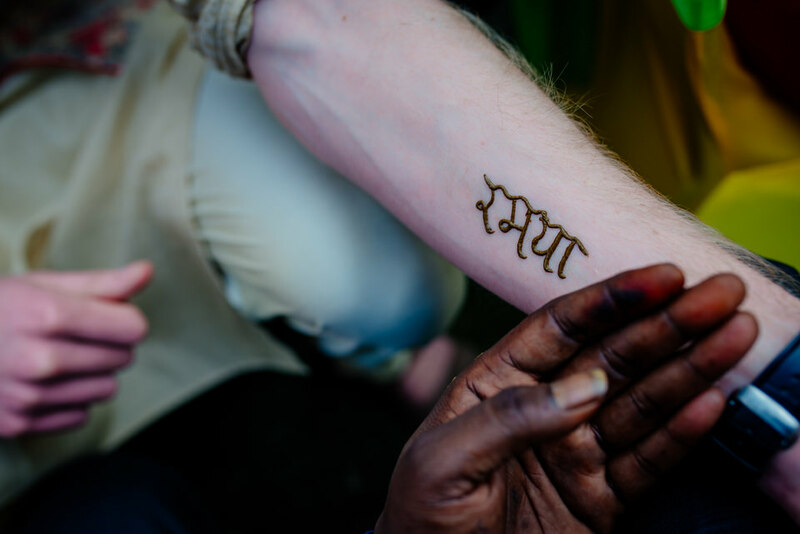 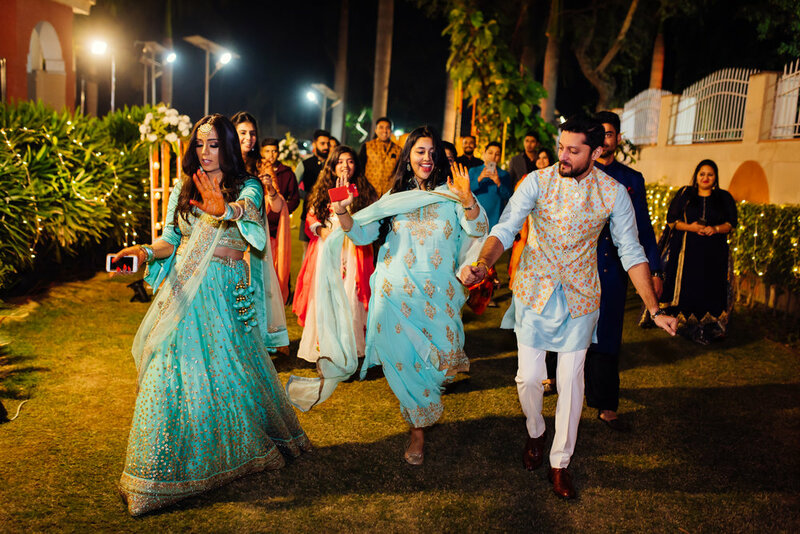 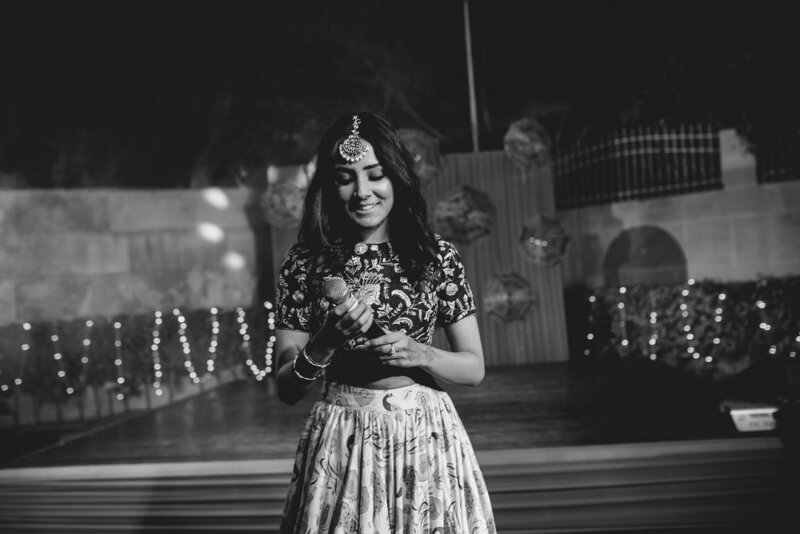 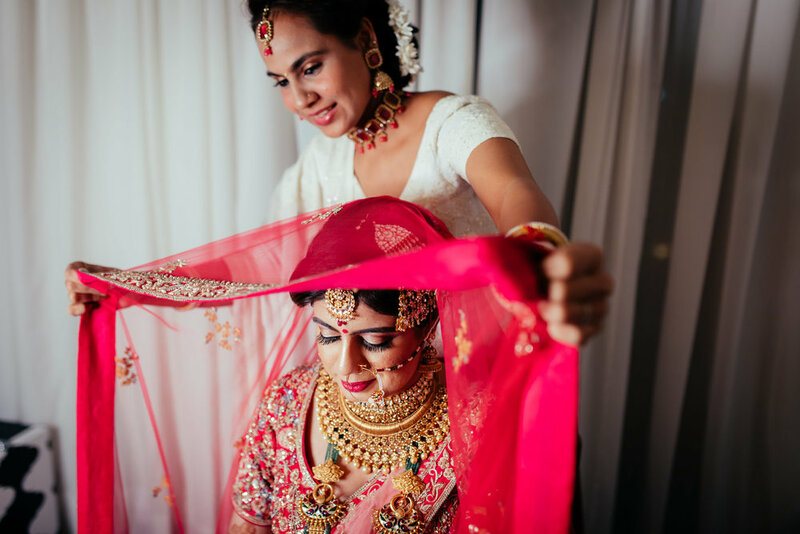 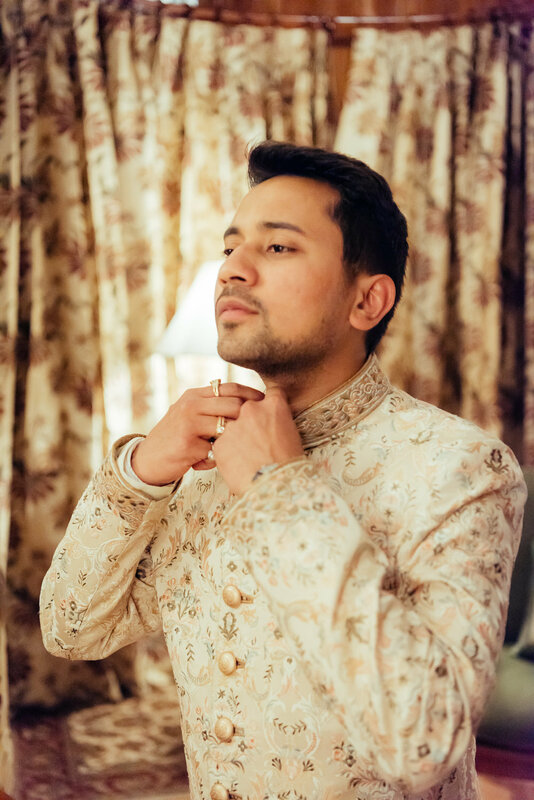 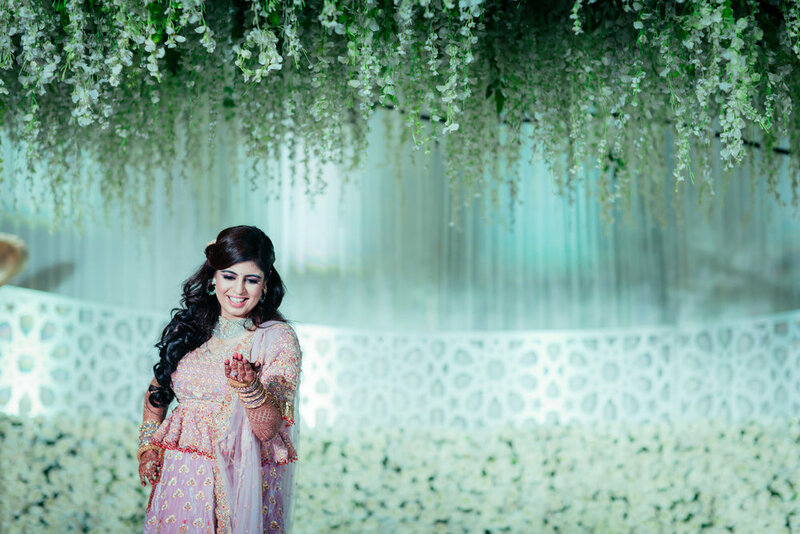 The haldi, Sangeet, pool party as well as the wedding held at the opulent space made this entire multicultural destination wedding even more special. 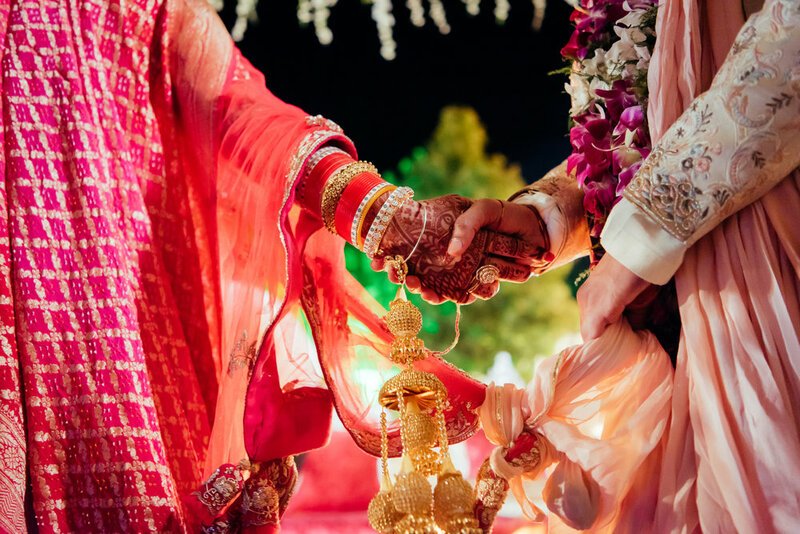 When two beautiful people come together, to share life, share love, one can do nothing more than just wonder in awe and pray that their love blooms stays strong till the end of time..
No matter what, love finds its soulmates and makes sure they hold hands forever. 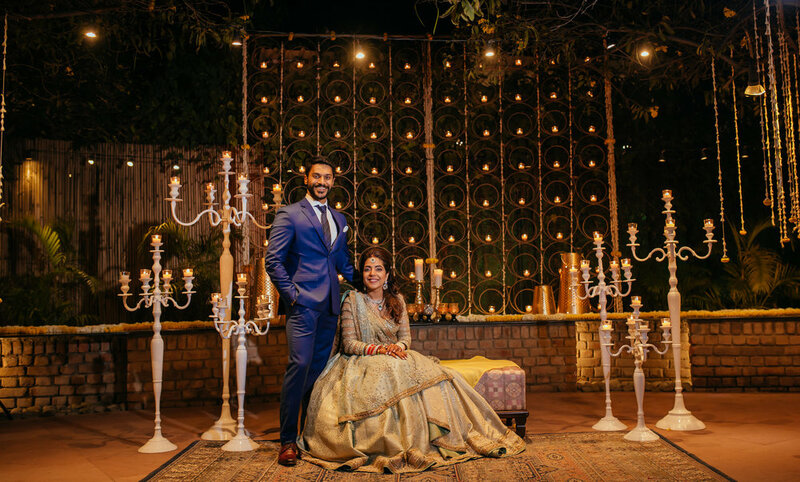 Sanaa & Arjun’s story proves just that. 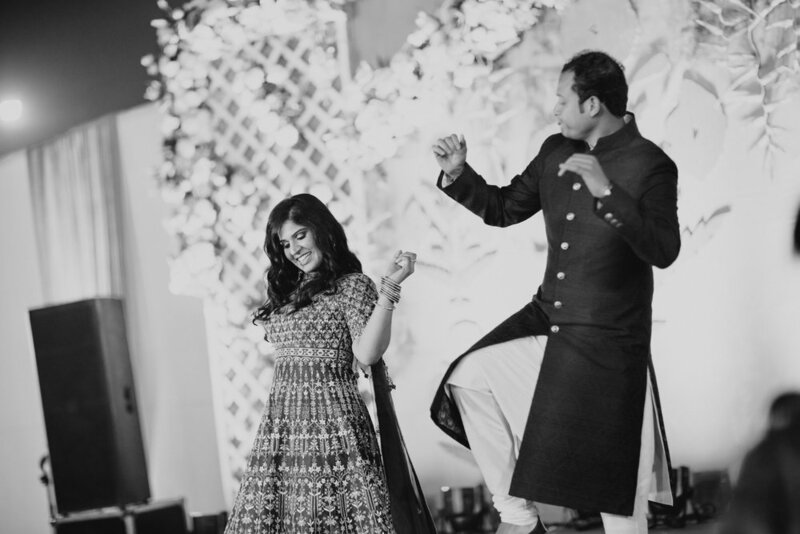 As two carefree individuals roaming around and conquering the world in their own ways, little did they know that they will stand conquered by a feeling that’d supersede everything else. 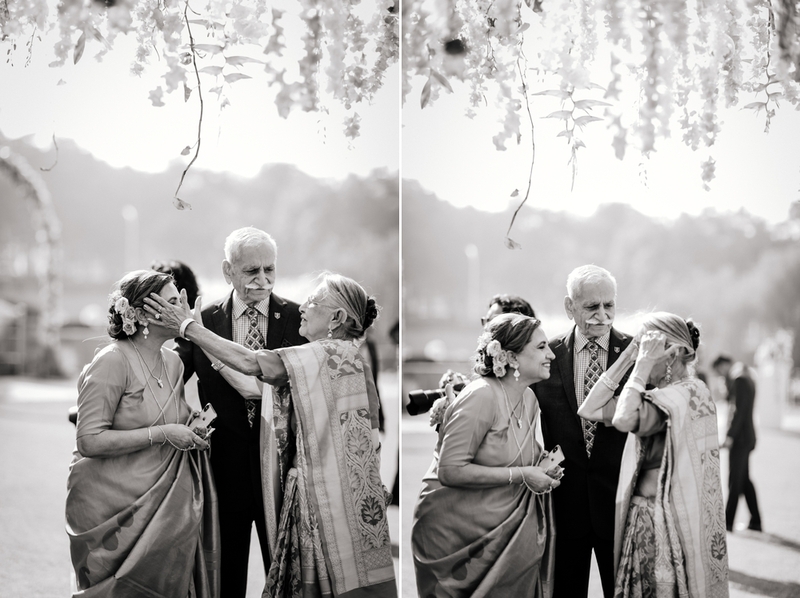 They first met 20 Years ago. 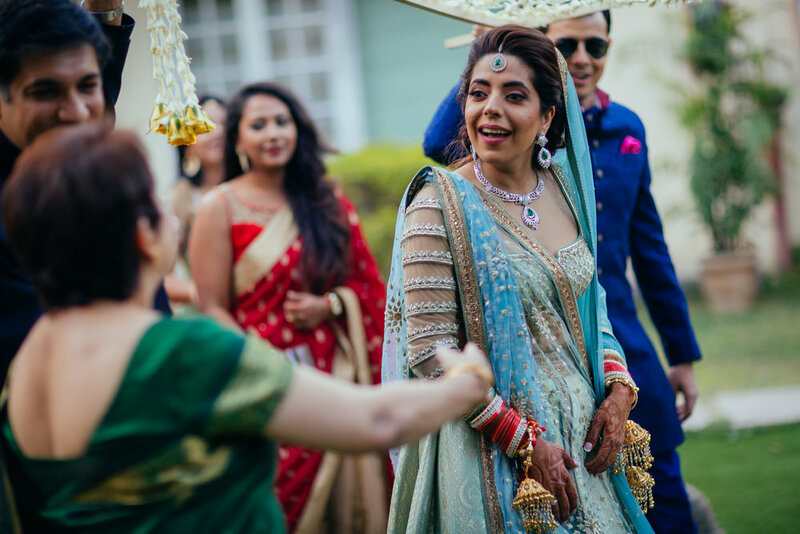 Sanaa noticed Arjun because he was her friend’s elder brother. 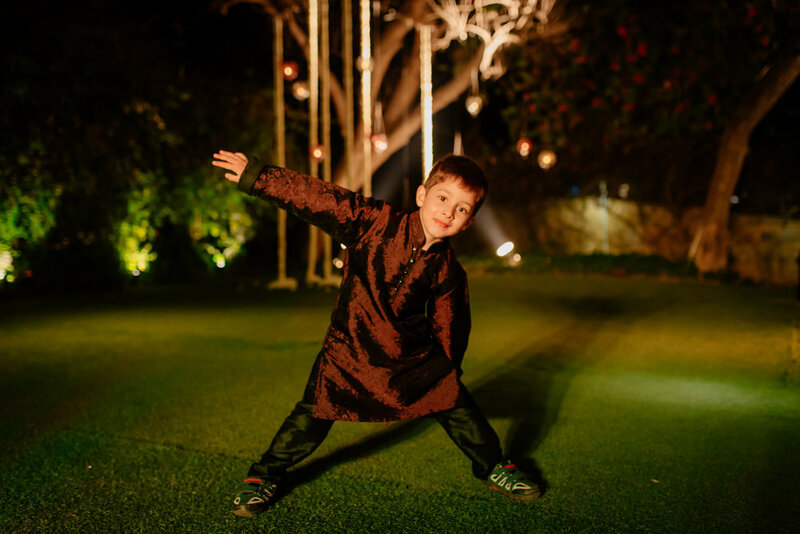 Arjun has childhood memories of meeting her once a month and being allergic to eachother and as per Sanaa he was so Gawky’! 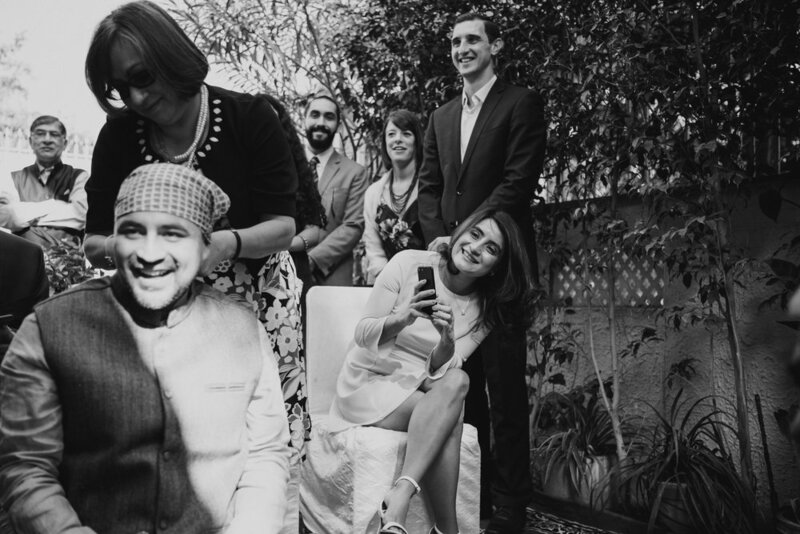 Sanaa moved to Australia with her family and Arjun’s family moved to the US in 2005. 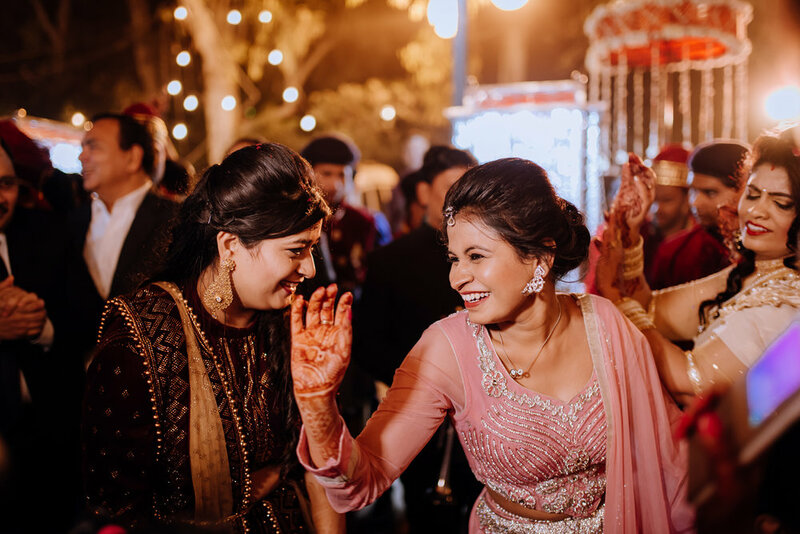 They were in touch through facebook and there messages were limited to birthday/diwali/new year wishes…. 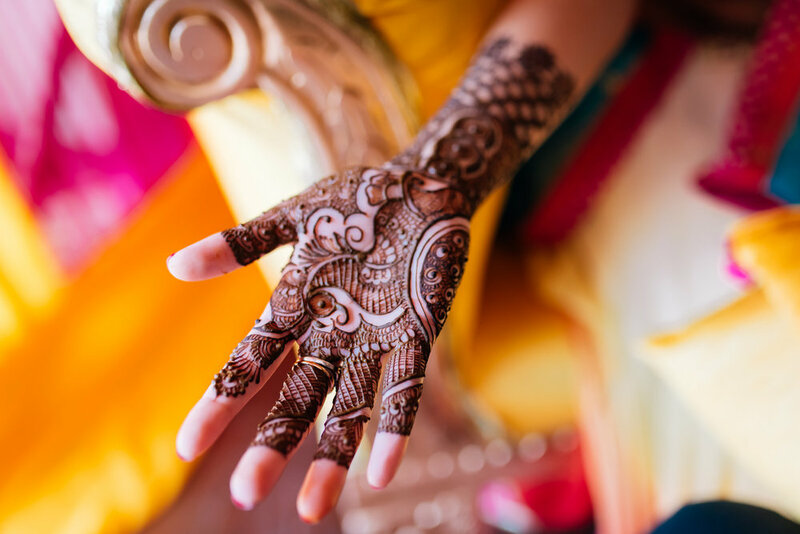 Sanaa moves to the US for work. 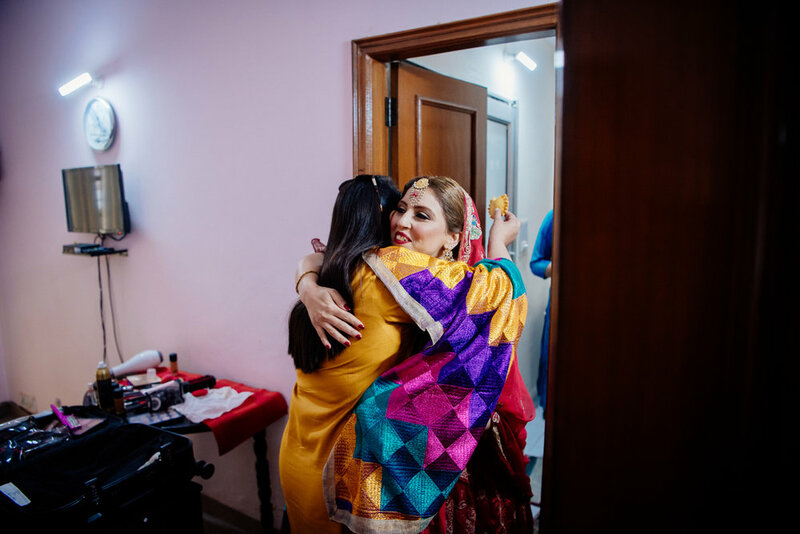 They met again this time at Arjun’s sister’s wedding . 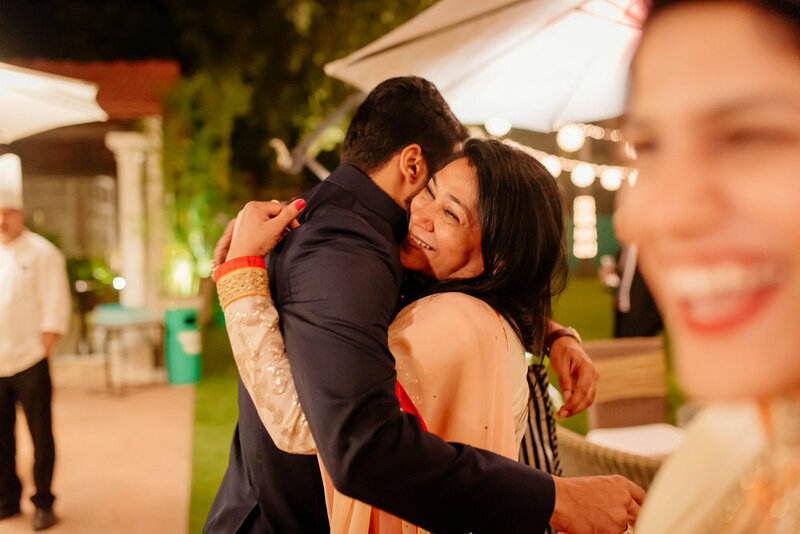 Being with and around her energy for three days made Arjun realized that he didn’t want to let her go, without knowing when they would meet again. 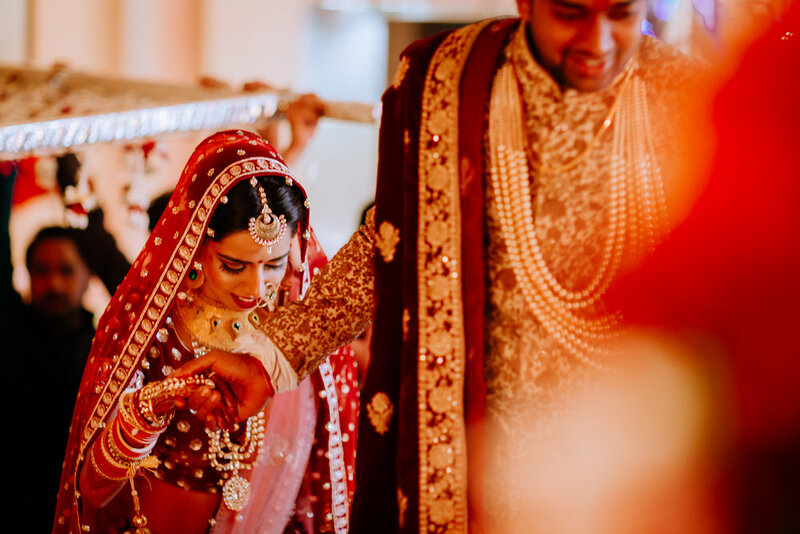 The “ups” were the weeklong trips they would make to see each other every three months beginning June of that year… the “downs” were the times when they had to part, the time they had to spend apart, slowly working towards being together forever – a textbook long distance relationship. 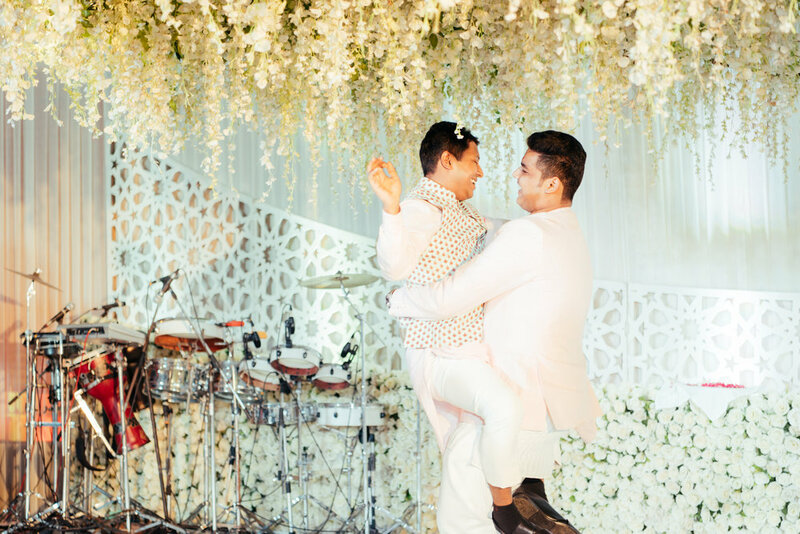 Arjun’s Shrewani - Gaurav Chhabra & Co.
No matter what, love finds and binds soulmates and makes sure they hold hands forever. 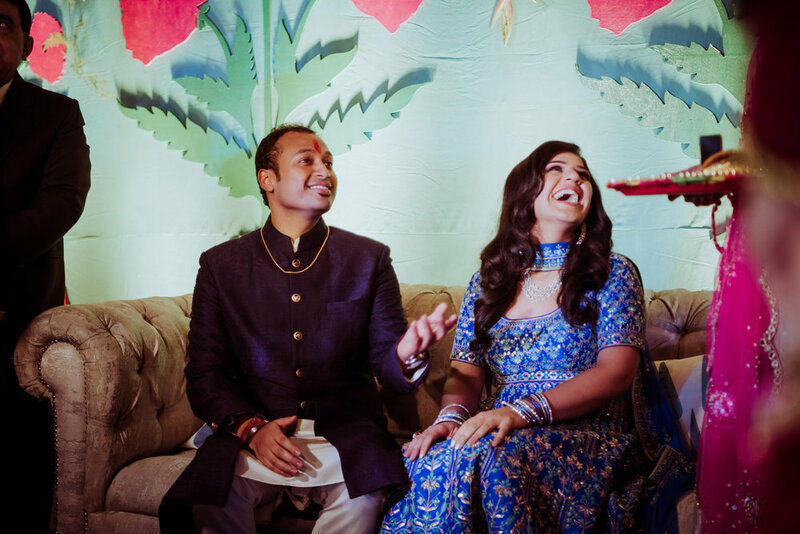 Elaisha & Jeremiah's story proves just that. 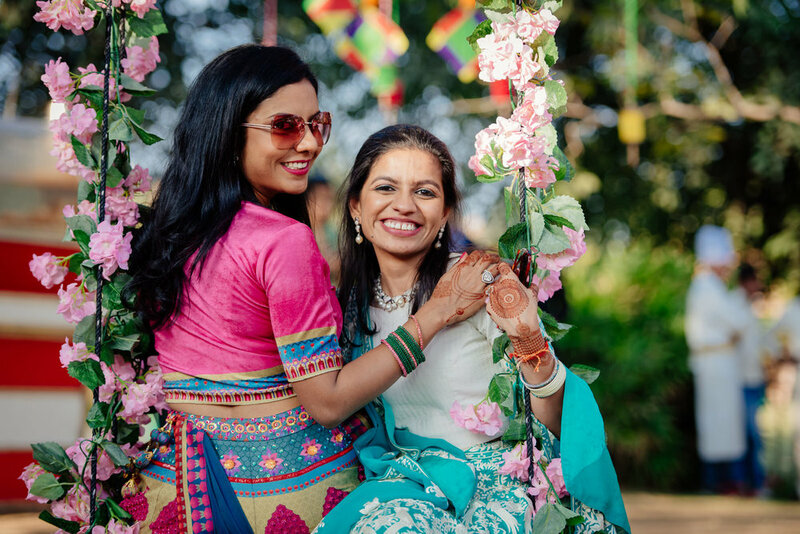 As two carefree individuals, roaming around and conquering the world in their own ways, little did they know that they will stand conquered by a feeling that will supersede everything else. 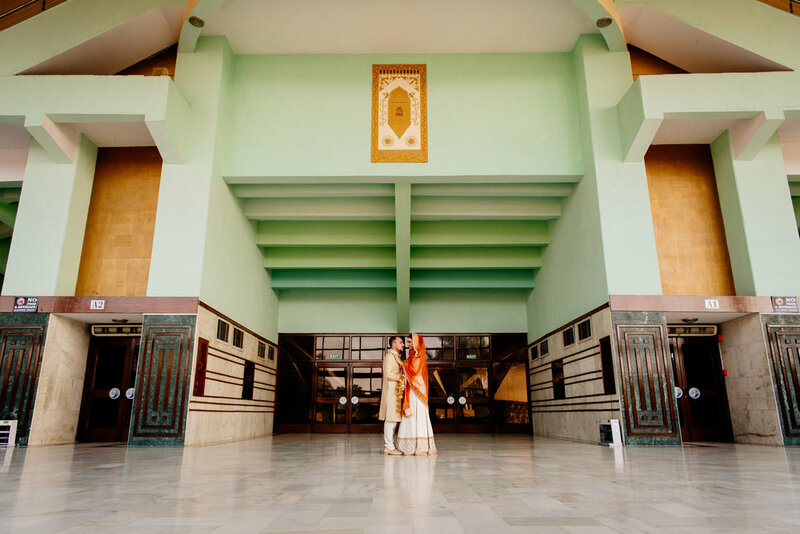 They met for the first time in UCLA - Law School, where Elaisha was Jeremiah's tutor in one of the semesters. 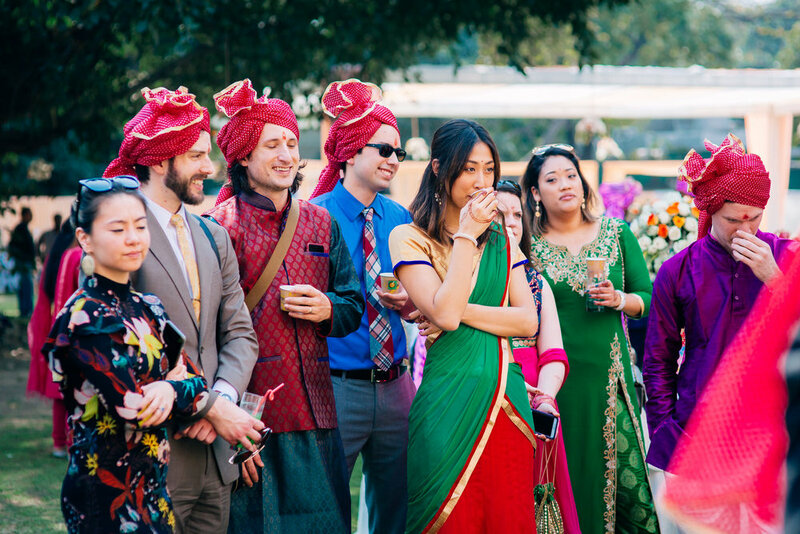 But the “first meeting” was at a law school party when Jeremiah’s roommate introduced them. 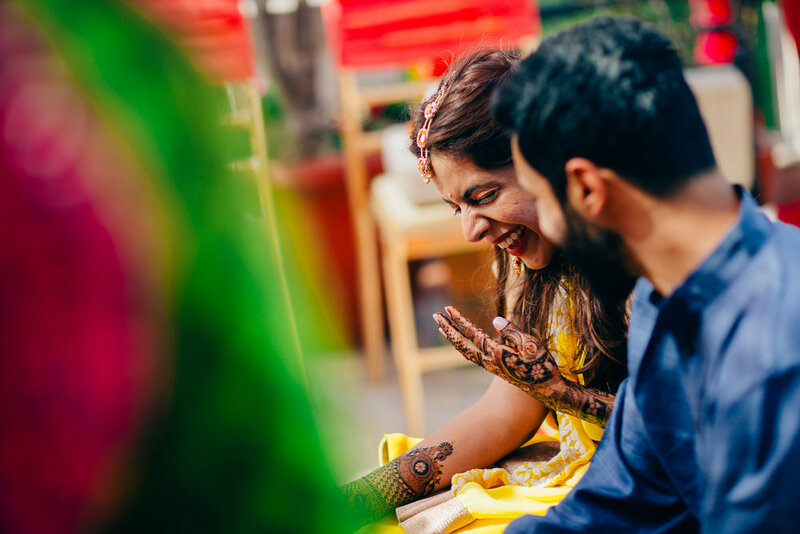 They spent a summer away from each other, and it wasn’t until both got back to law school after the summer that they were able to grow their friendship into something deep and beautiful – a bond that’s been growing and evolving over the years. 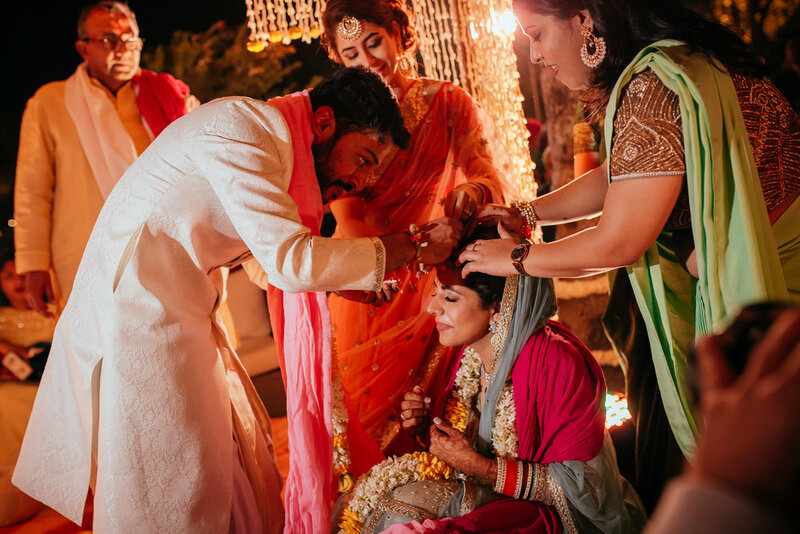 A close set of friends and family came together to bless this wonderful couple tying the knot in New Delhi all the way from California. 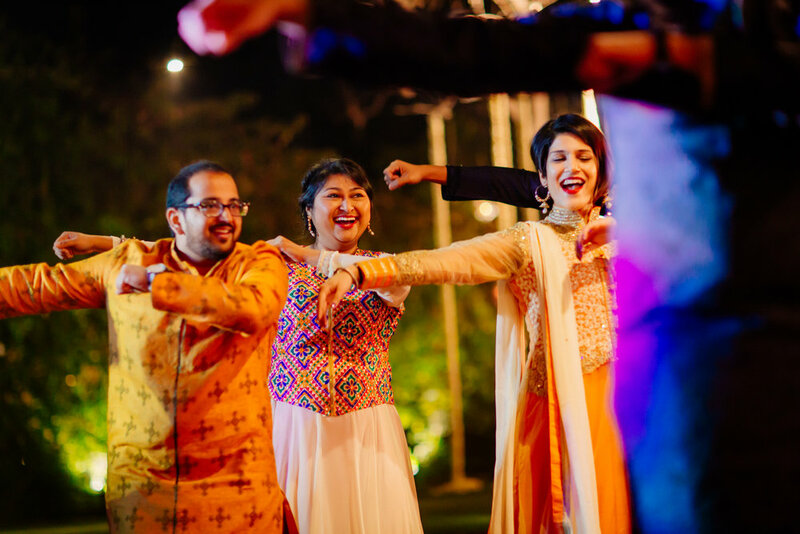 Theirs was a wedding full of colors, fun, and dance. 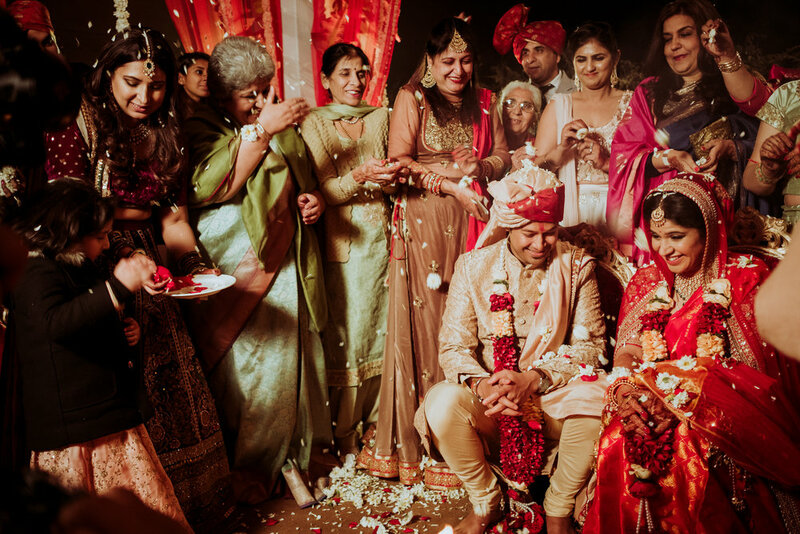 We were lucky to have been able to cover E&J’s wedding and be a witness to this beautiful amalgamation of cultures. 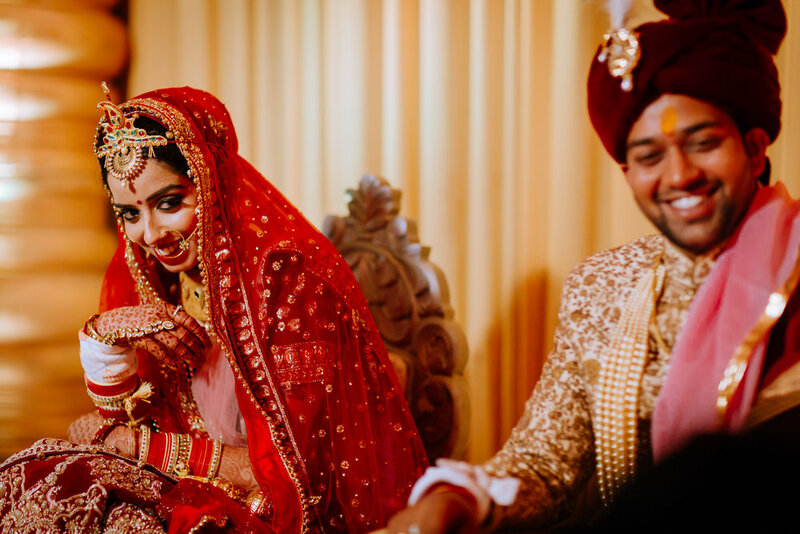 Wishing the lovely couple a very happy future together. 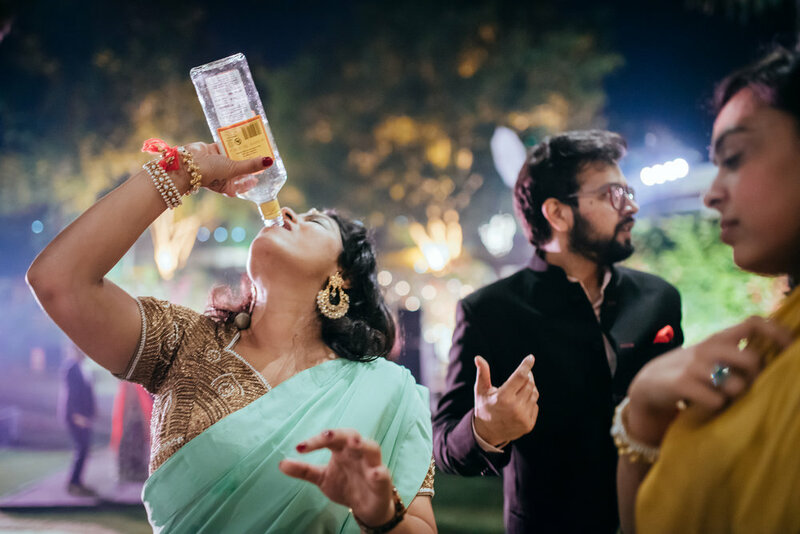 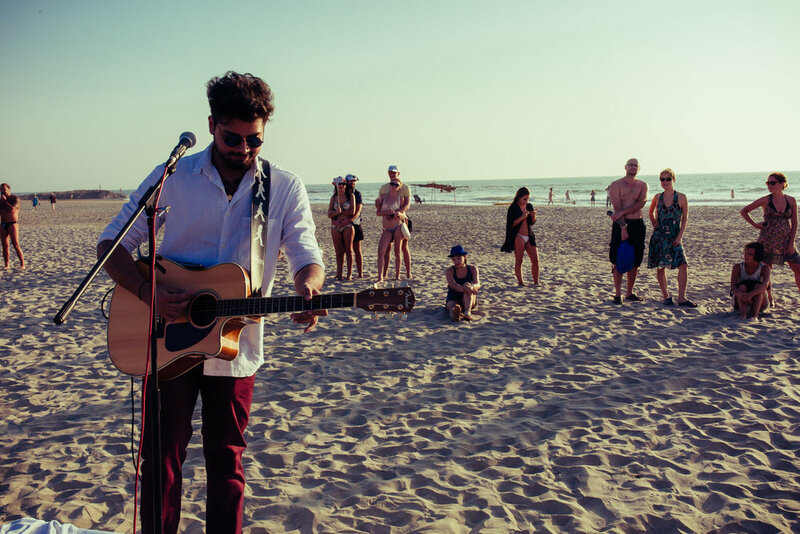 When one hears the words “Goa” and “Wedding” in the same sentence, one is bound to have a mental image of fun, water, and grandeur. 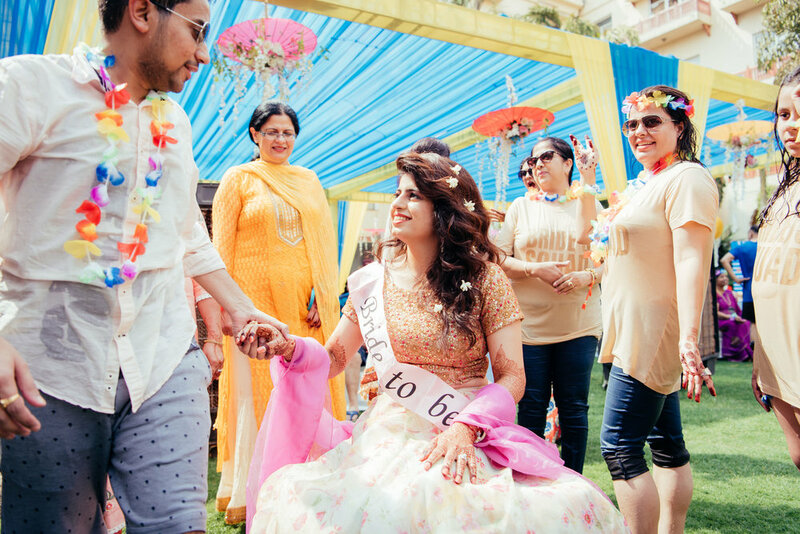 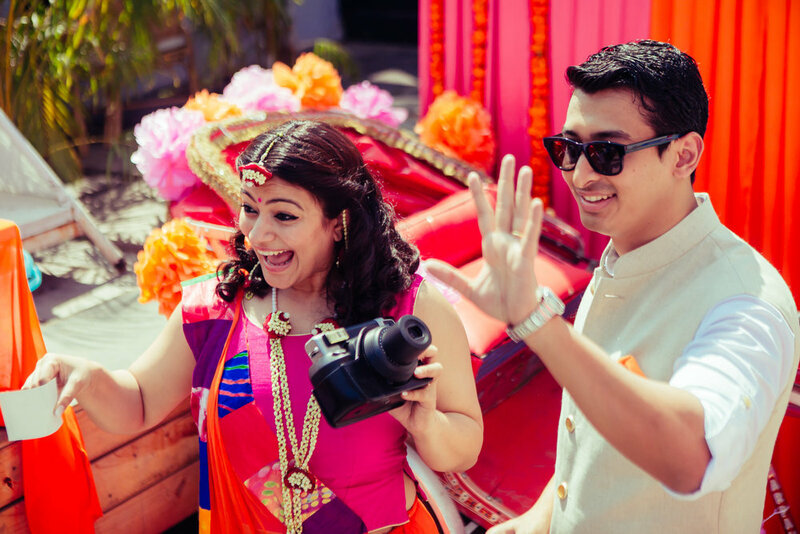 This is exactly what we experienced at Anjali & Michael's Goa wedding; all smiles and sunshine with a super fun photo booth and a beautifully decked up mandap on the beach. 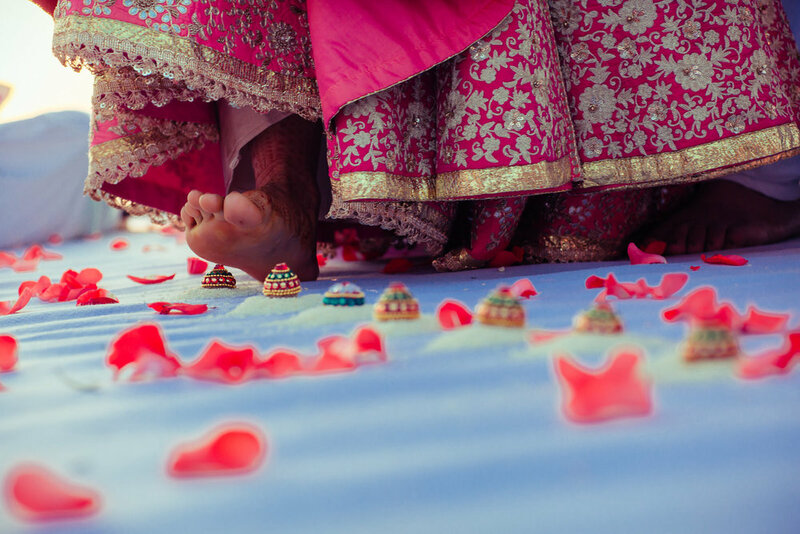 Colors are all that we remember from this wedding!! 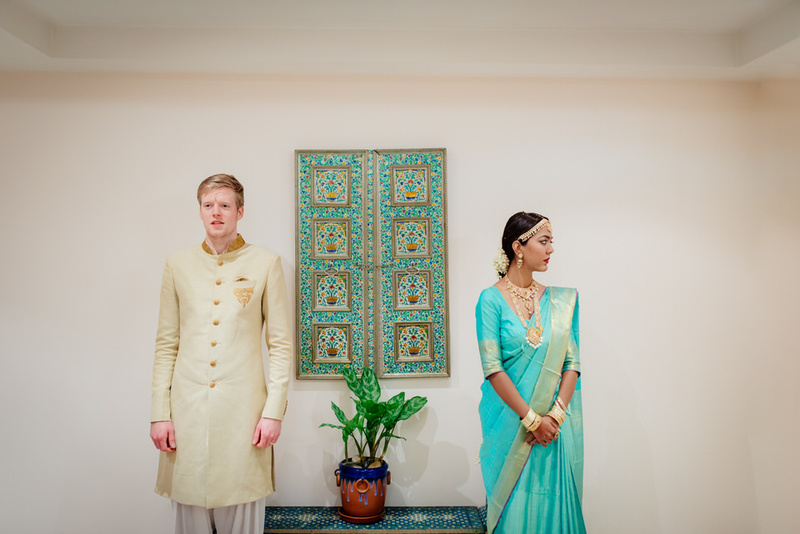 With a couple as charming as them, it is only natural to stay stunned. 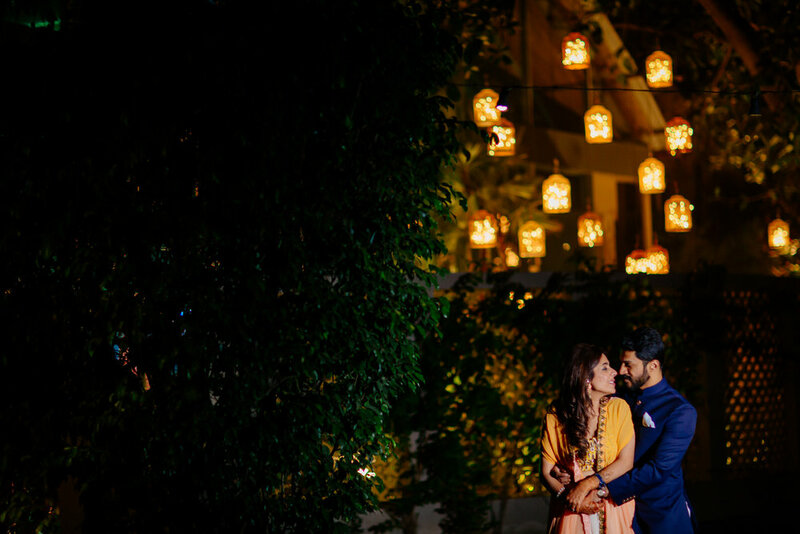 Needless to say, we had the most wonderful time shooting their big day..
Also check out the wedding video. 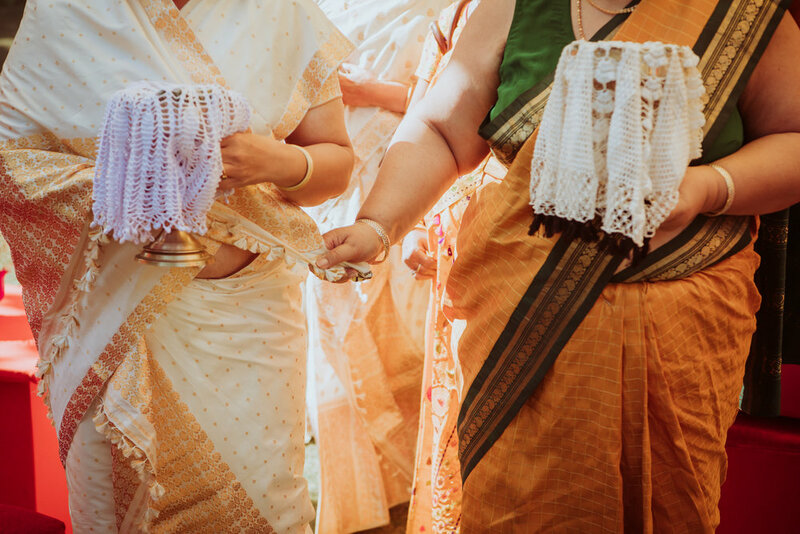 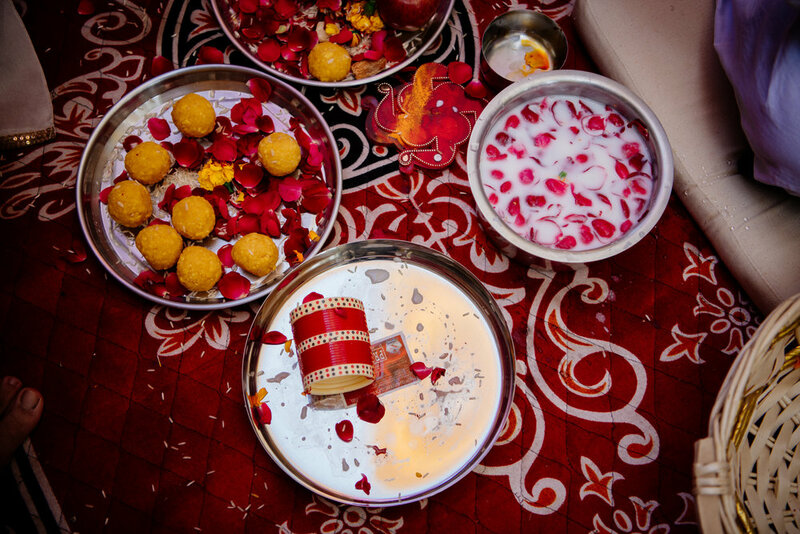 Tamil brahmin weddings are a treat to shoot, for all the fun and rituals they come with. 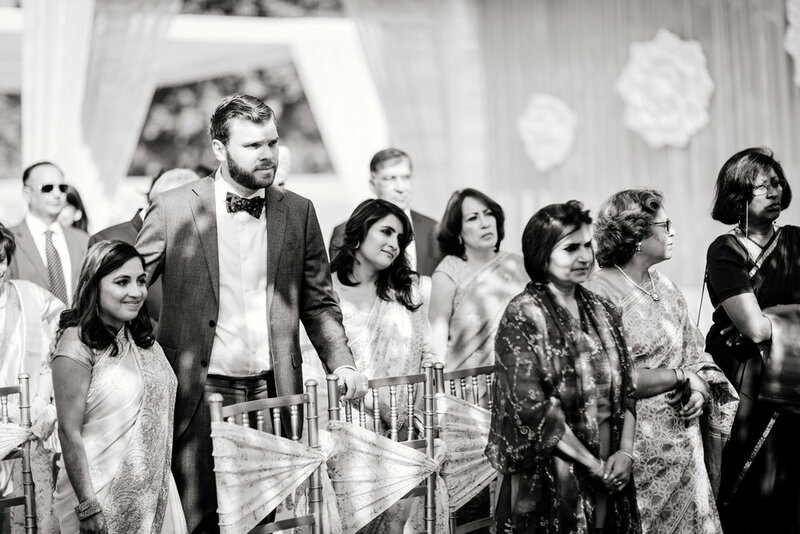 The big day of Ramya and Jelle was no exception. 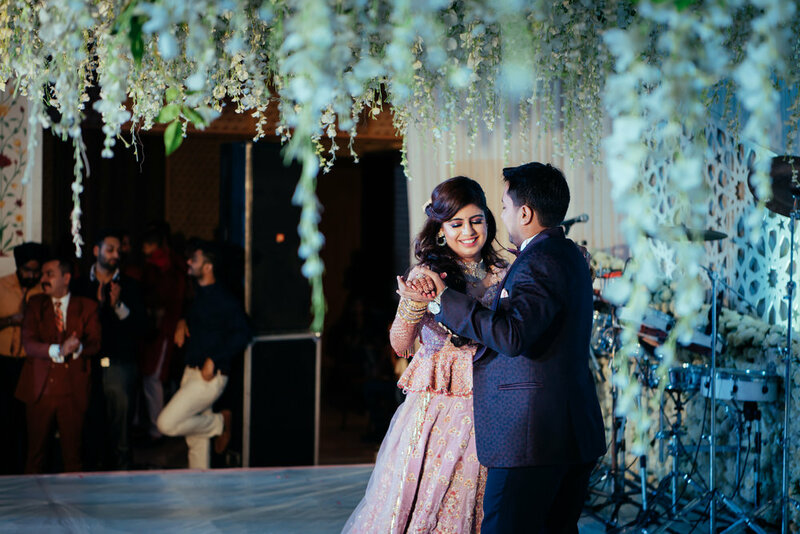 The couple had a wonderful love story that stayed woven to their smiles all through the celebrations. 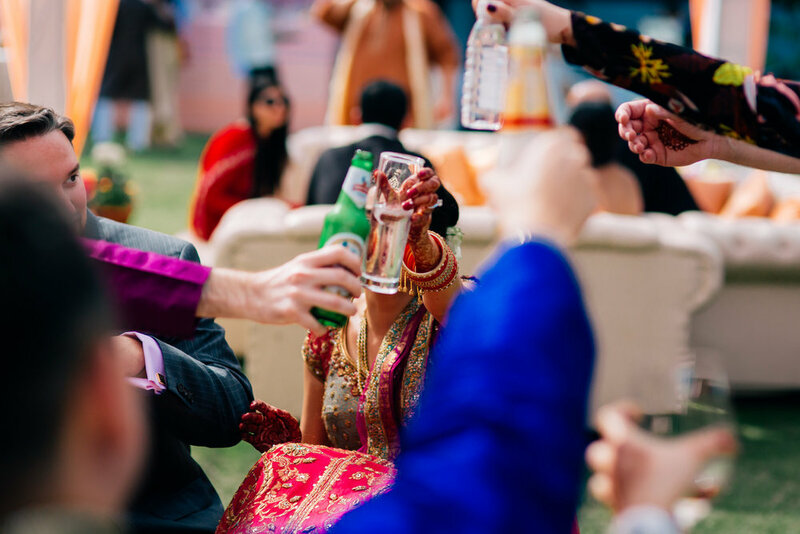 “An Indian girl met a Belgian boy , and fell in love before they knew. 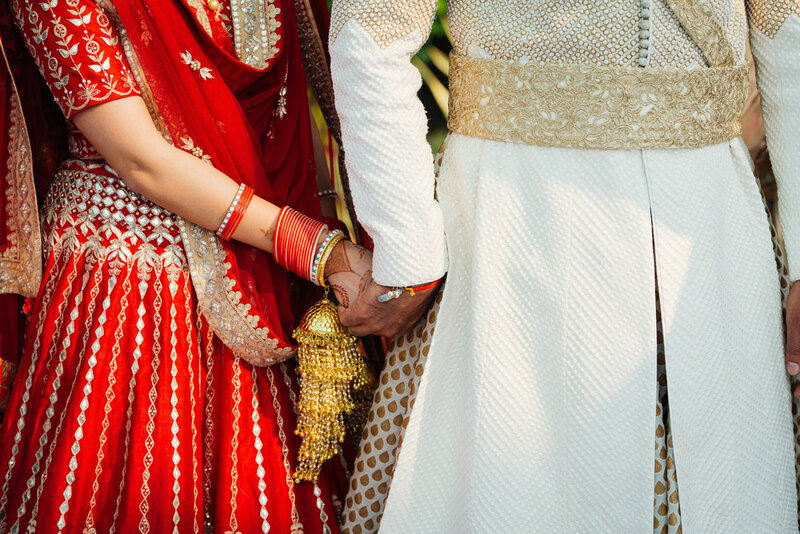 In a matter of time, they decide to have each other by their side forever." 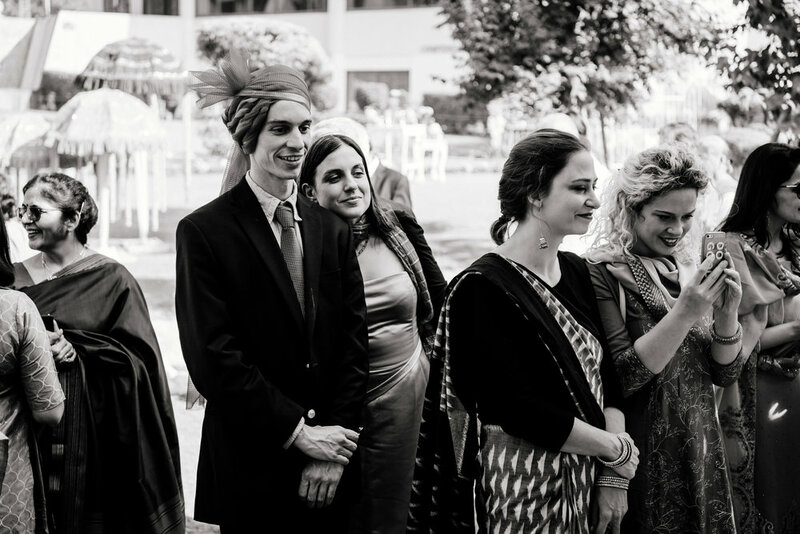 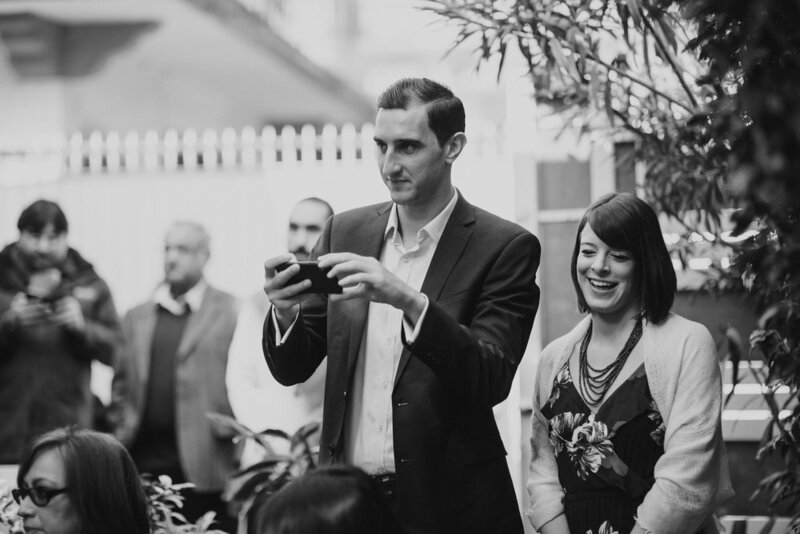 All the way across, with a bunch of thick friends from Belgium, they came down to Delhi, to get married. 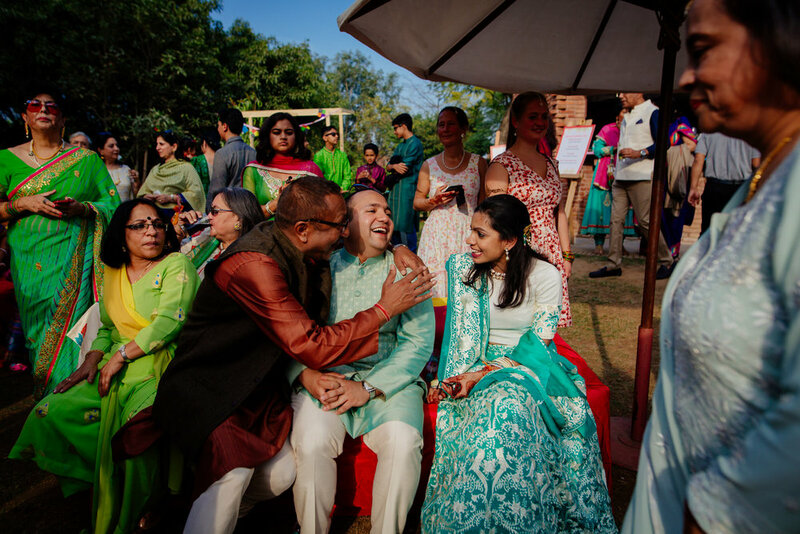 It was wonderful to see their parents getting into the gala and enjoying every moment equally too. 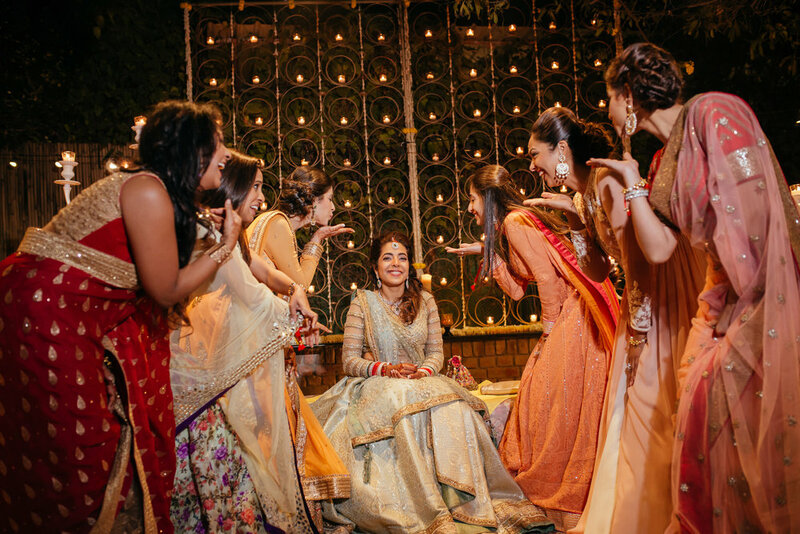 And their friends, yes, they did light up the occasion with all the excitement in the world. 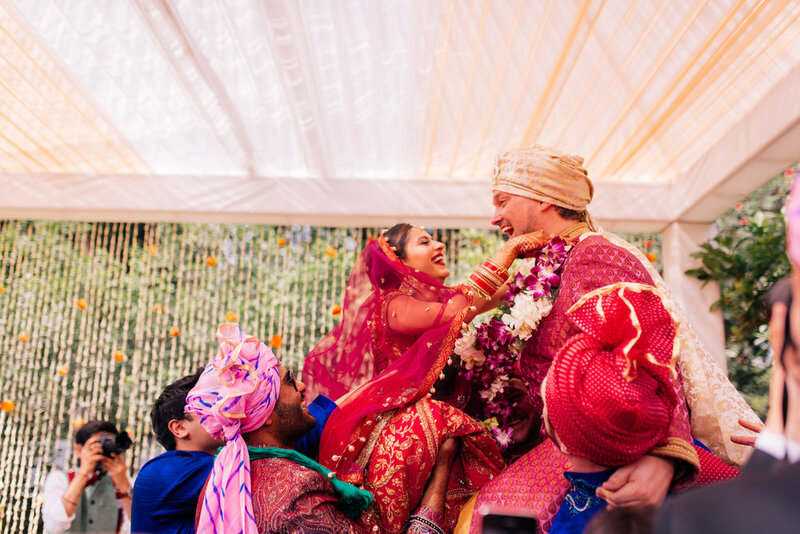 Take a look at the special moments of Ramya & Jelle, compiled for you in this blog. 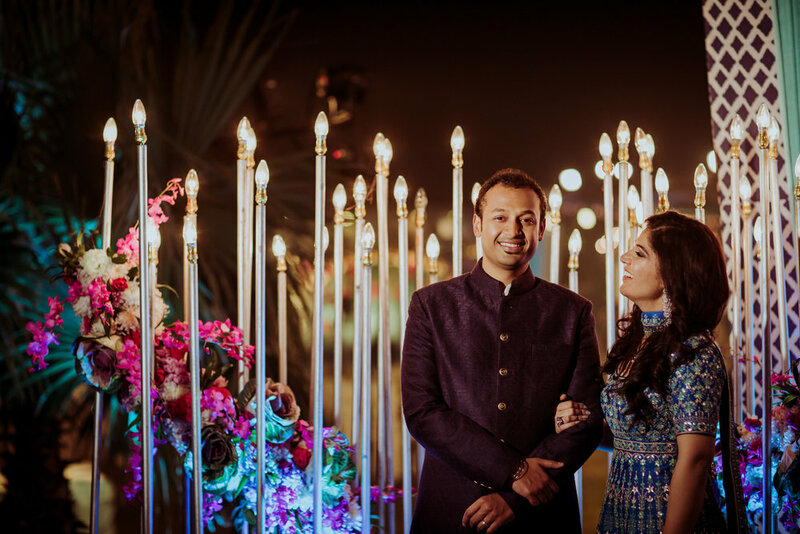 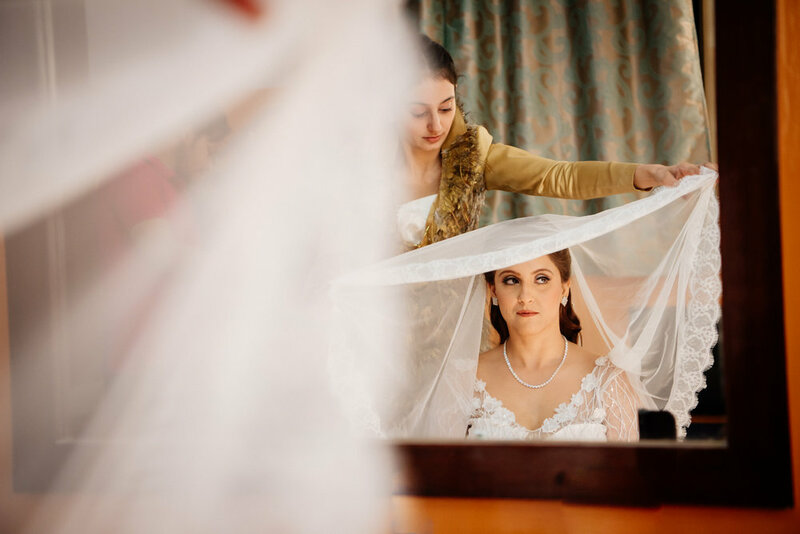 Kriti & Aman both are from Dubai and decided to get married in Zorba resort in New Delhi. 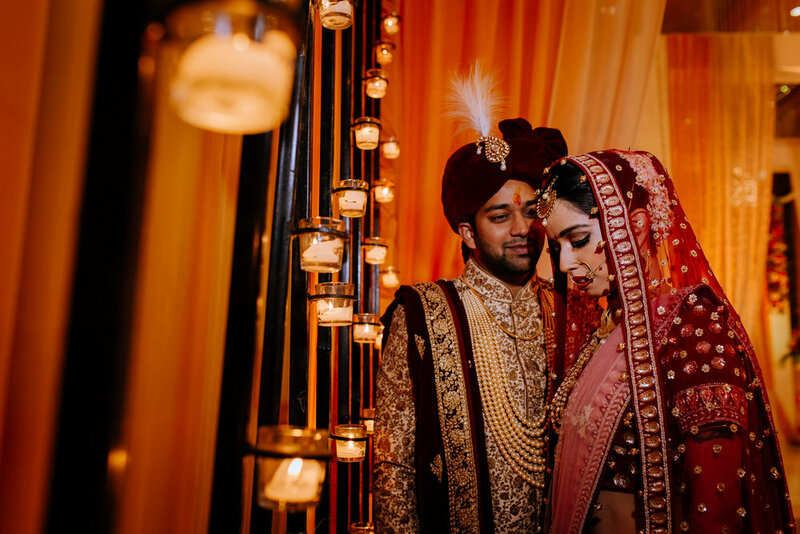 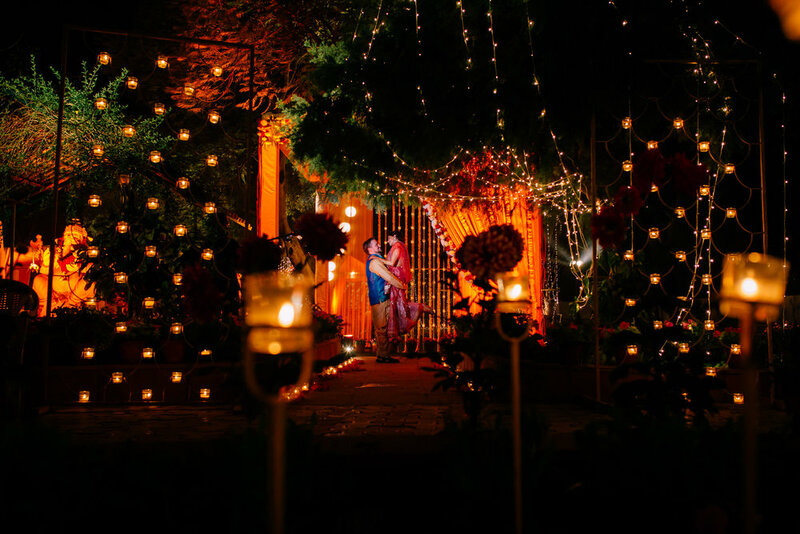 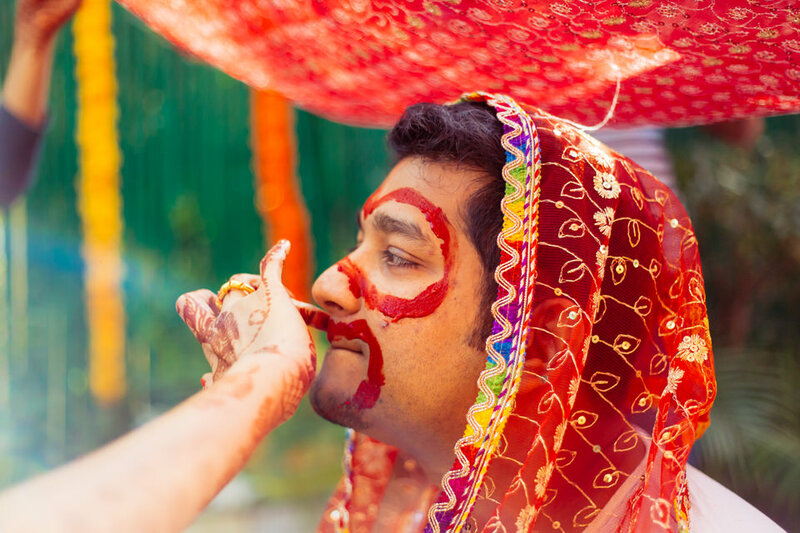 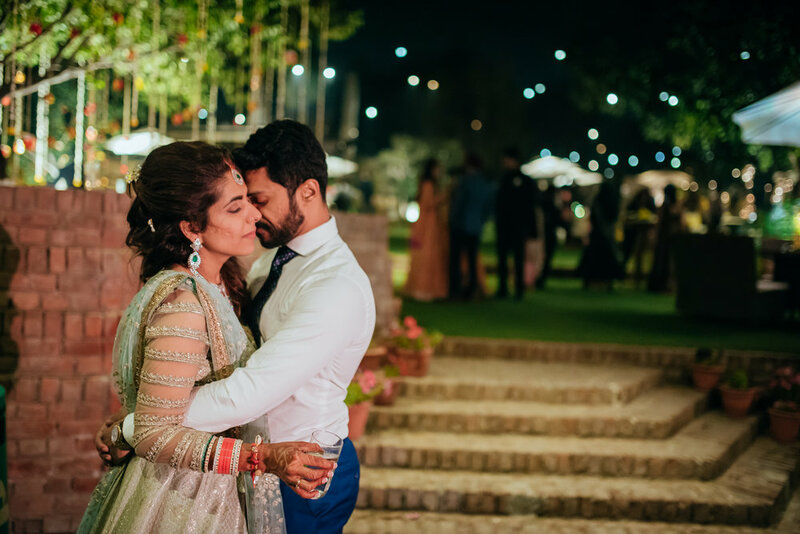 The wedding of Kriti & Aman was a feast of hearts we’d say. 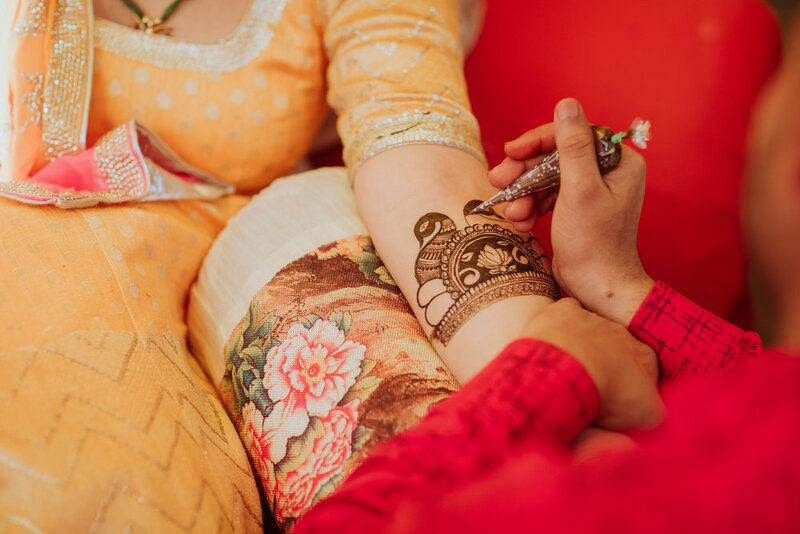 From the colorful mehndi till the tie of the eternal knot on the big day, it was a rollercoaster ride of love and laughter. 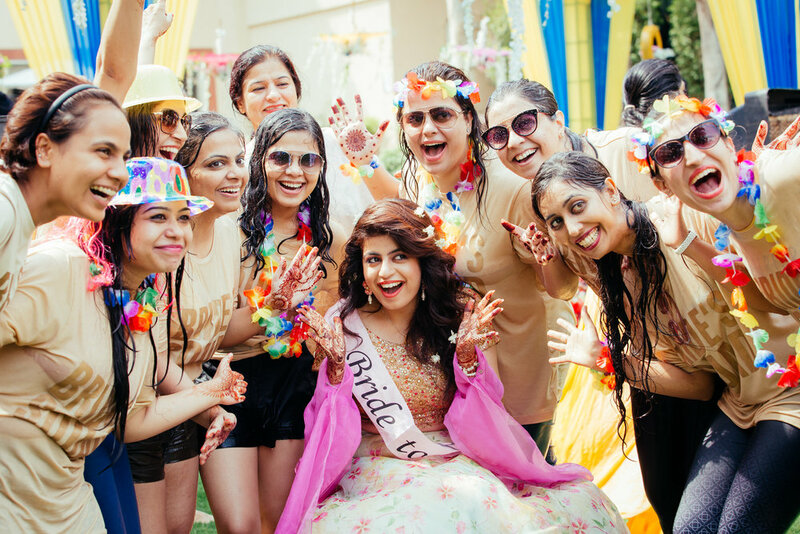 If happiness is measured by smiles, then Kriti would have possibly travelled miles. 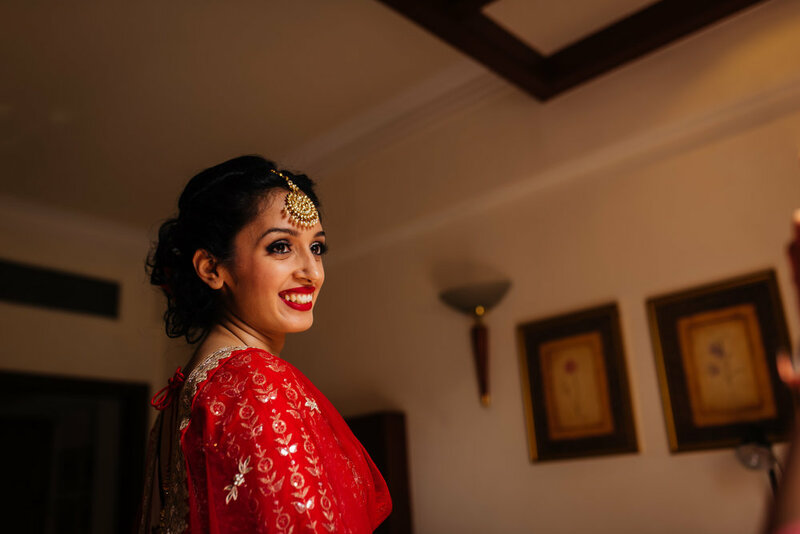 That’s how hearty a smile she sported all the way along her journey to her eternal day with the handsome groom Aman. 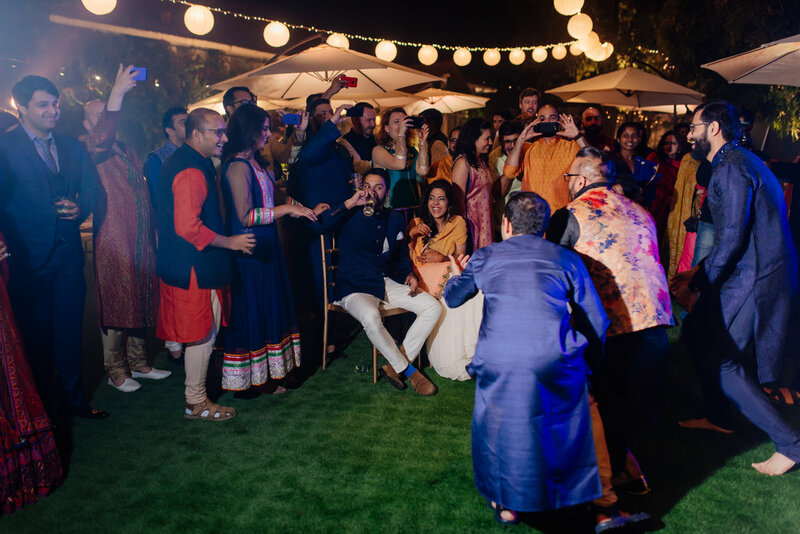 It was a perfect family wedding, in fact, a very intimate get together we should say. 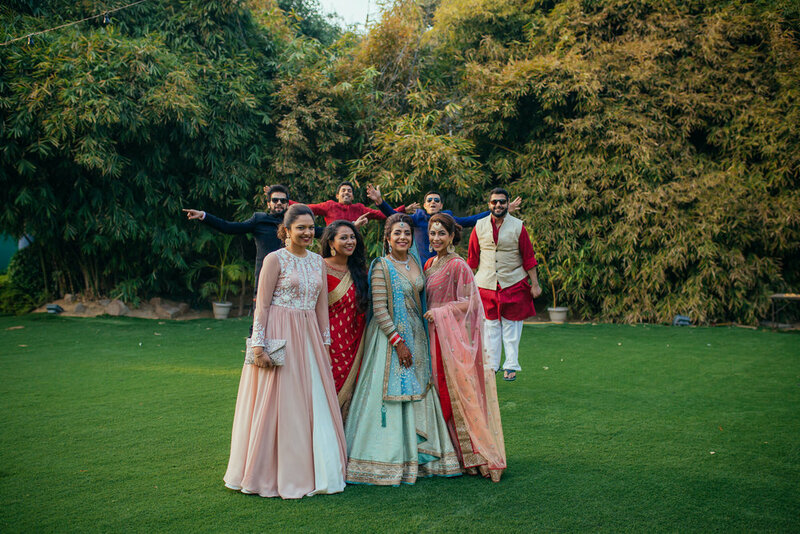 Not just the couple but the entire gathering was all the time in a gala mood, rejoicing the proceedings. 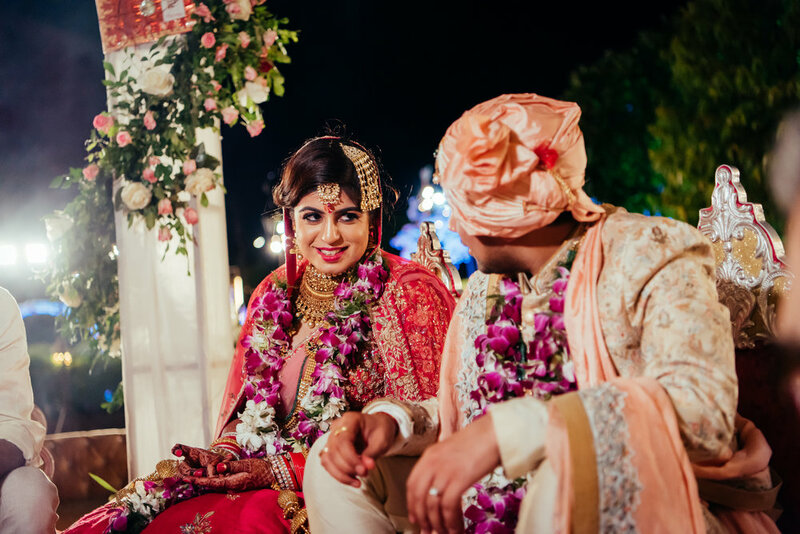 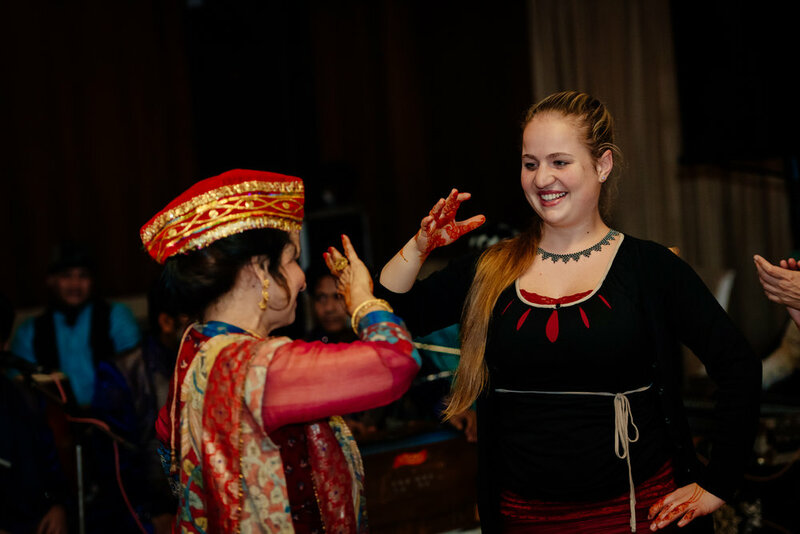 It was the perfect atmosphere that gathered in for the special evening of Aaisha and Avneesh. 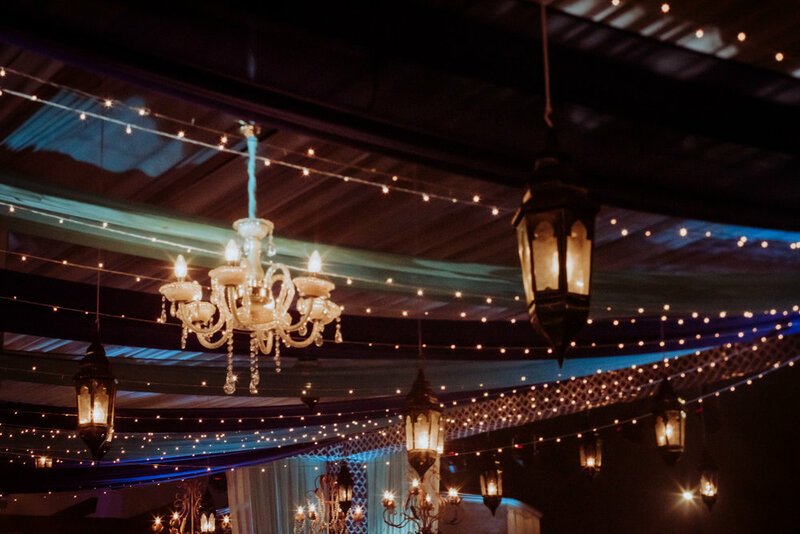 The décor was too good and the lights were dazzling as the Sun bid bye for the celebrations to begin. 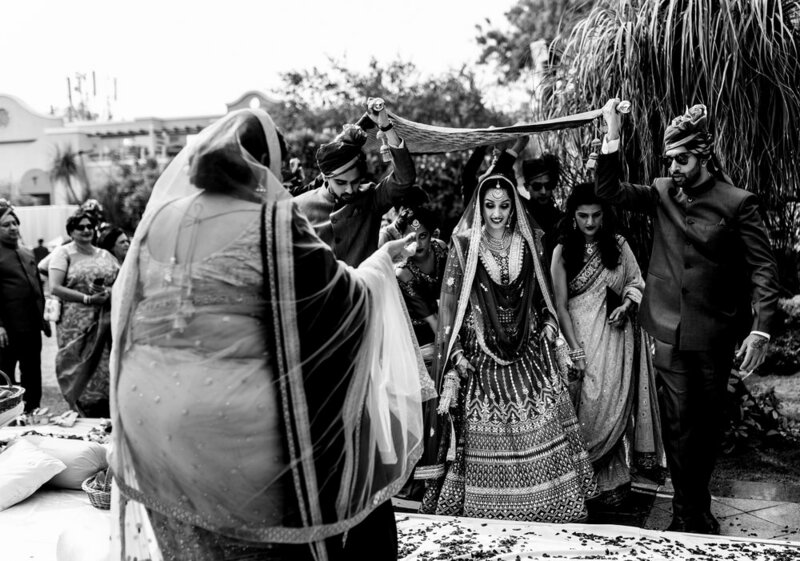 Both the bride and the groom looked stunning and at their best, it was a treat to watch them relish the togetherness. 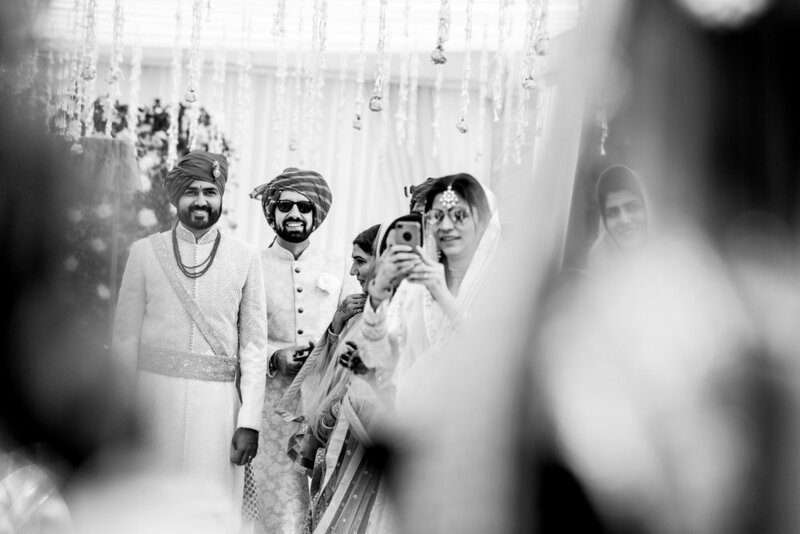 As photographers, what more can we ask for? 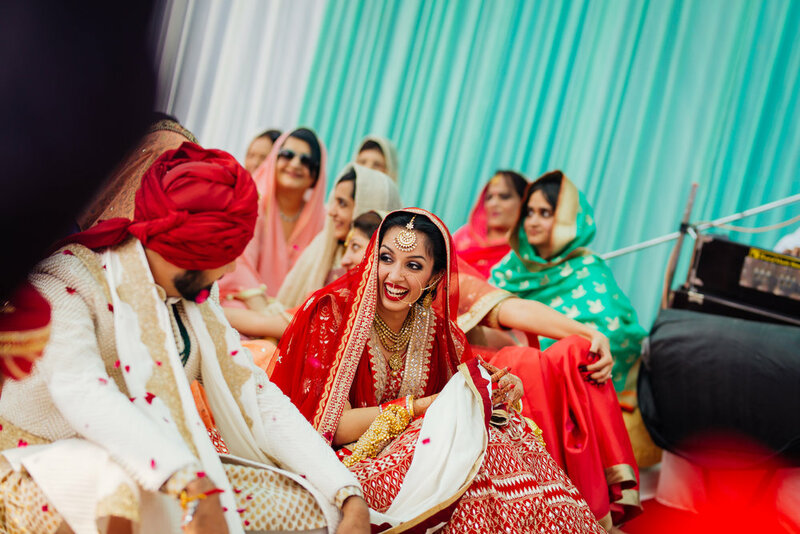 It was a series of joyful moments that we got to capture. 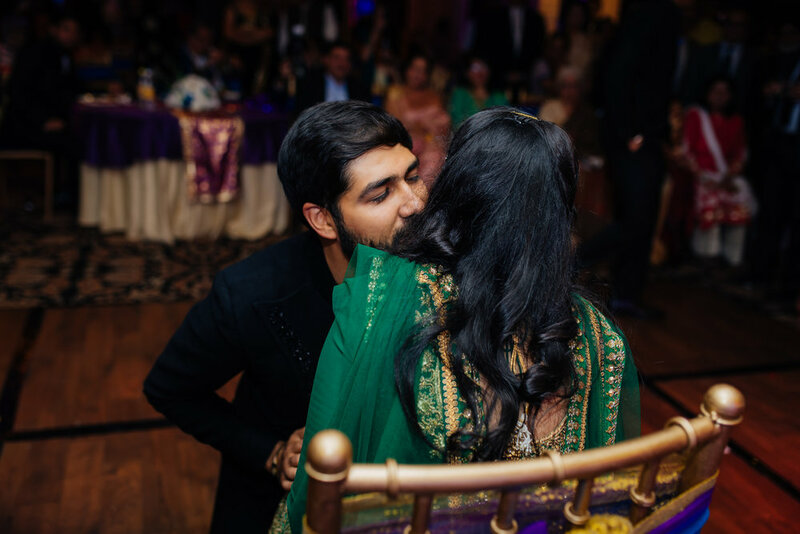 Take a look and feel the love in the air.